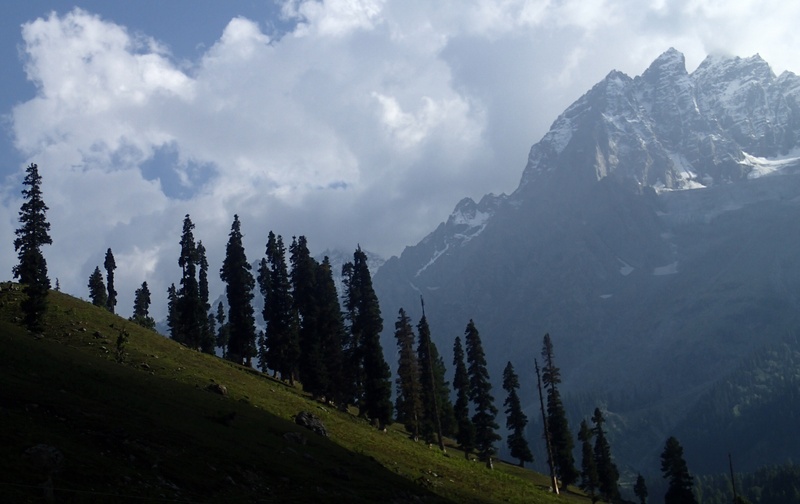 Sonamarg is at an altitude of around 9000 ft, which we hardly notice now. I slept well again and caught up a bit on the blog before breakfast. It feels nice not to be moving on today and to have a full day in the field. We need to think about this for next year’s trip too, making sure we don’t spend too much time driving. After breakfast Tashi drIves us, with Tahir, the few km to the start of the walk up to Thajiwas glacier over several obvious bands of terminal morraine. The walk up to the ‘glacier’ is lovely but what we find is really a permanent snow pocket rather than a proper glacier. That would be much higher up the valley than we walk. It takes us a good couple of hours to get this far, partly because there are lots of rocks, lichens and flowers to look at. 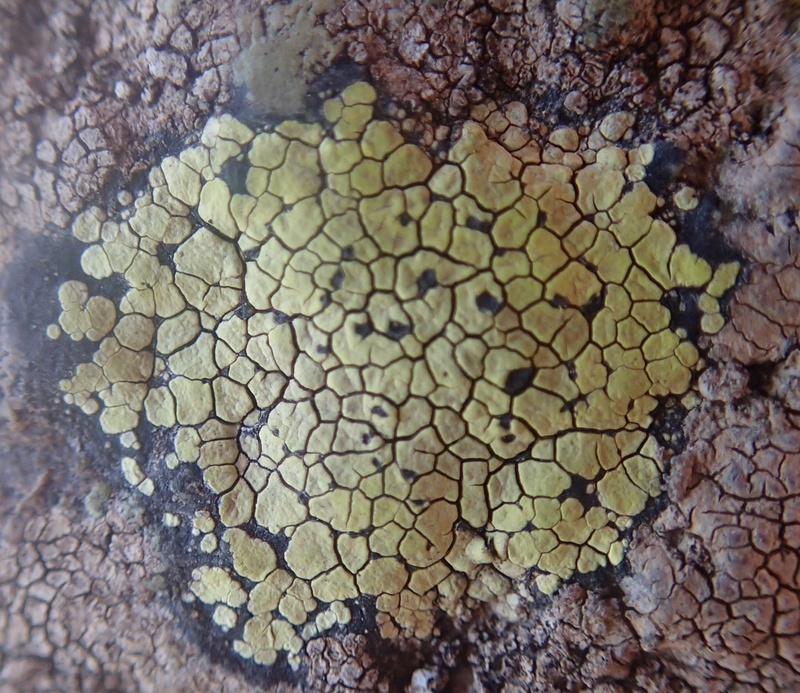 It’s obviously not going to be practical to measure lichens in an attempt to map the rate of glacier retreat here but at least we can look at the obvious changes in distribution – we see very few lichens up near the snow pocket. 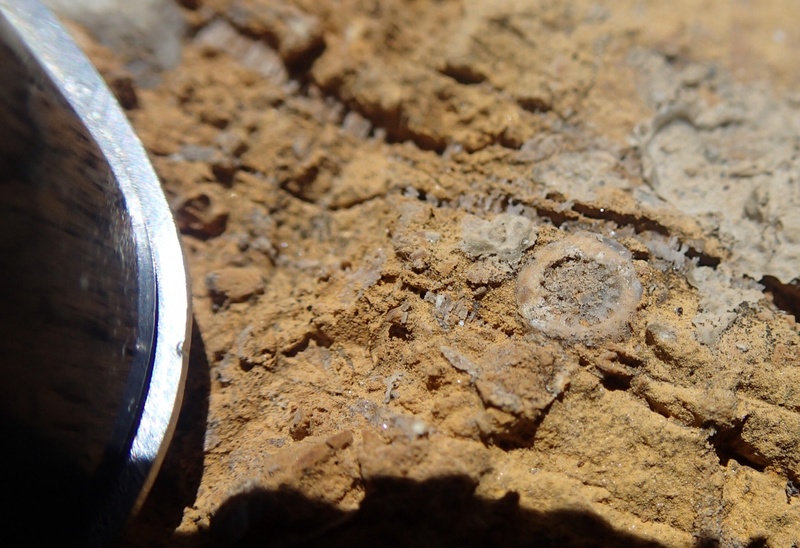 We find our first rock with fossils near the snow too – it contains lots of crinoid fragments. Unfortunately, because it’s at the base of a glacier it could have come from miles away, so doesn’t tell us much. 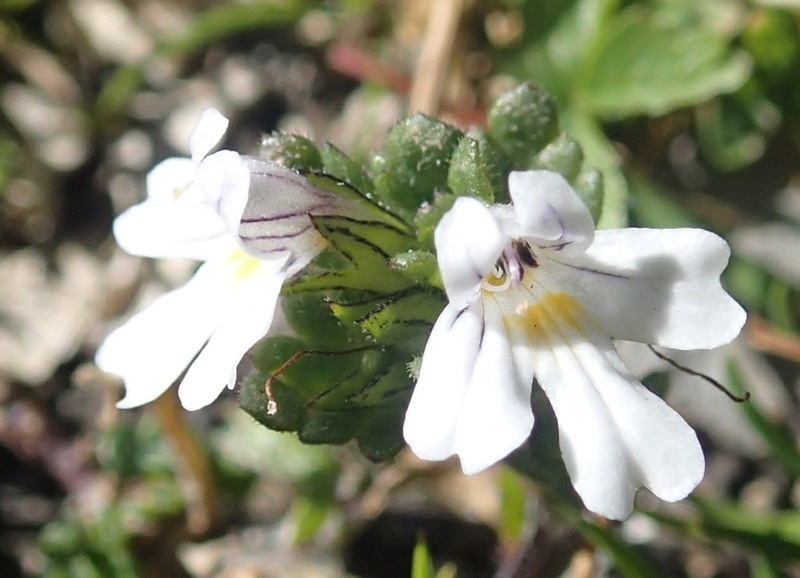 There are lots of tiny alpine plants up near the snow, too, many familiar to us – geraniums, buttercups, stitch wort, eye bright, alchemilla, forget-me-nots and quite a range of ferns. 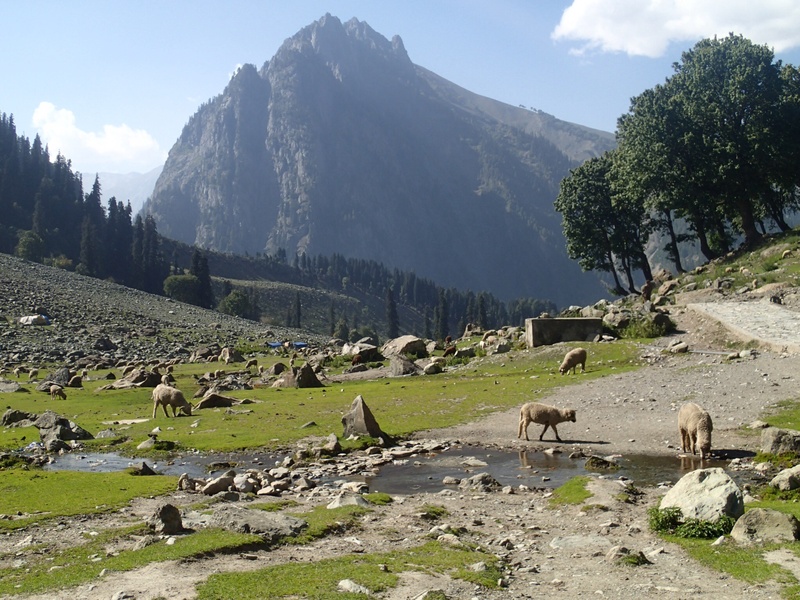 Lower down the valley the slopes are being well grazed by sheep gathered for the Eid festival next week, so there is not much sign of the meadows for which Sonamarg is named. We are not back at the hotel for lunch till after 3pm and John, Helen and I just have soup and bread. Tahir and Tashi manage to tuck away substantial amounts of rice and curry though! Late afternoon, John and I sit down and draft an itinerary for next year’s trip – it is starting to take shape. 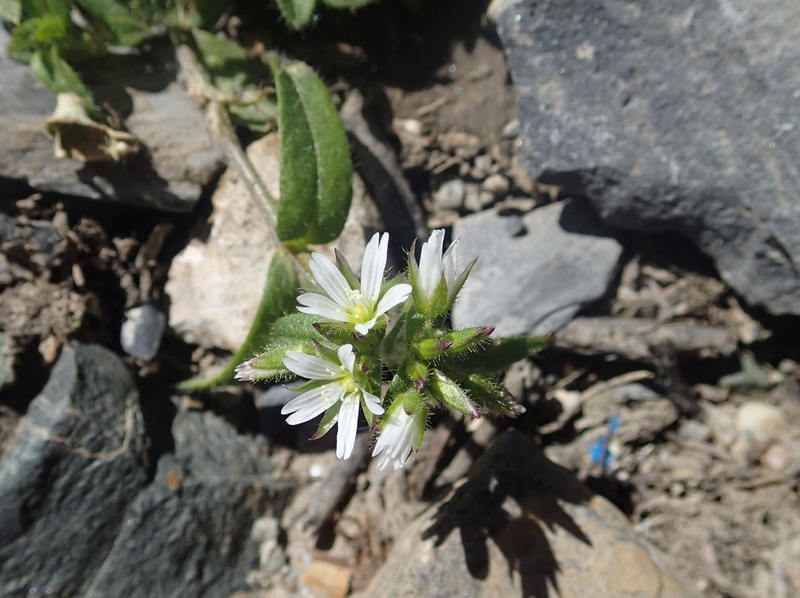 Plant adaptations to their environment will be one of my main themes for the ecology part of the trip, linked by things like the effect of rock type, effects of altitude and salinity to the underlying geology. We’ll also be looking a little at how humans manage to live in such an environment and their effects on it, in turn. I have a welcome cup of tea with John and Helen when the power comes on and shower before dinner. We have to drag Tashi and Tahir away from the cricket for this – both are very keen and were out playing with the hotel staff earlier. Everywhere we go we see boys of all ages playing cricket, often in the street. We breakfast at 8 am this morning on tasty omelettes and, less appealing, cornflakes with hot milk – the latter takes me straight back to the Plateau Hotel in Jos! We are leaving at ten to go to the Central Asian Museum so venture out for a short walk after breakfast but head in the wrong direction for the centre of town, unfortunately. It’s nice to stretch our legs anyway but I feel much too conspicuous in shorts and change into a long top and leggings on our return. We leave at ten and Tashi has a somewhat hair-raising drive to the museum through the narrow backstreets of Kargil, which turns out to be closed, unfortunately. They are waiting for a curator to come from Srinagar to help them sort out some exhibits, apparently, and it doesn’t look like this will happen any time soon. 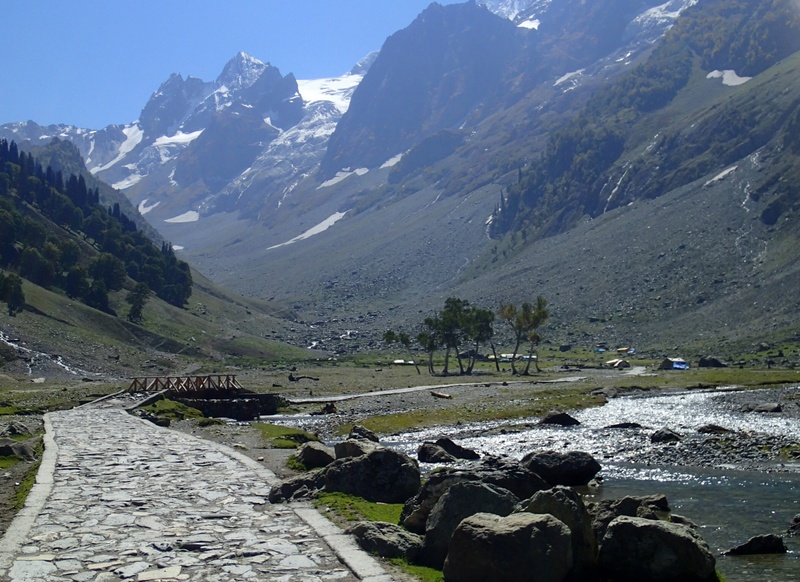 From Kargil, we set off towards Sonamarg. Tashi points out the high wall lining the road as we leave the city, explaining it was to protect Indian vehicles from Pakistani fire during the 1999 war. The cease fire line is very close here. John manages to match up the rocks we see along the route more easily today but shortly after Drass we notice the vegetation starting to creep up the hillsides. There is much more flowing surface water around and properly developed soils along the roadsides now. The houses change too – sloping tin rooves and chalet style buildings, some very grand, replace mud brick walls and flat roofs. 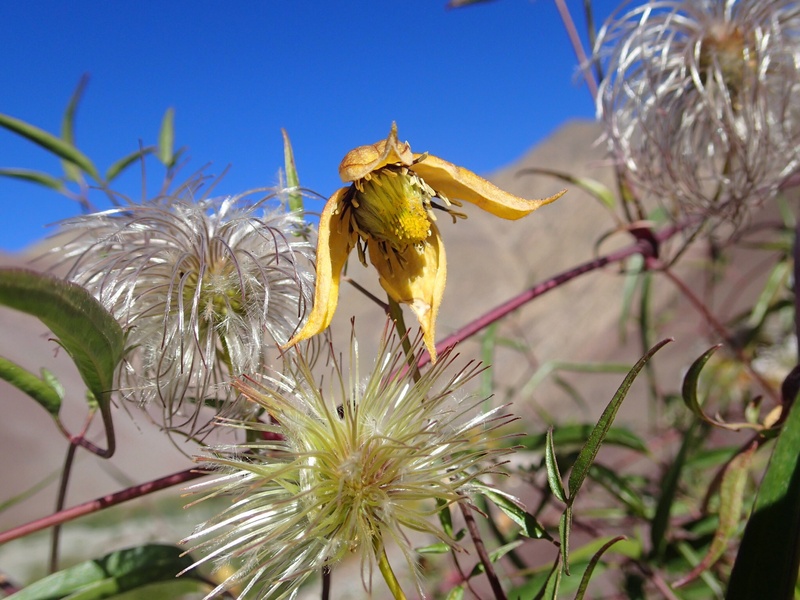 These are to deal with the increased rainfall and snow, Tashi says. 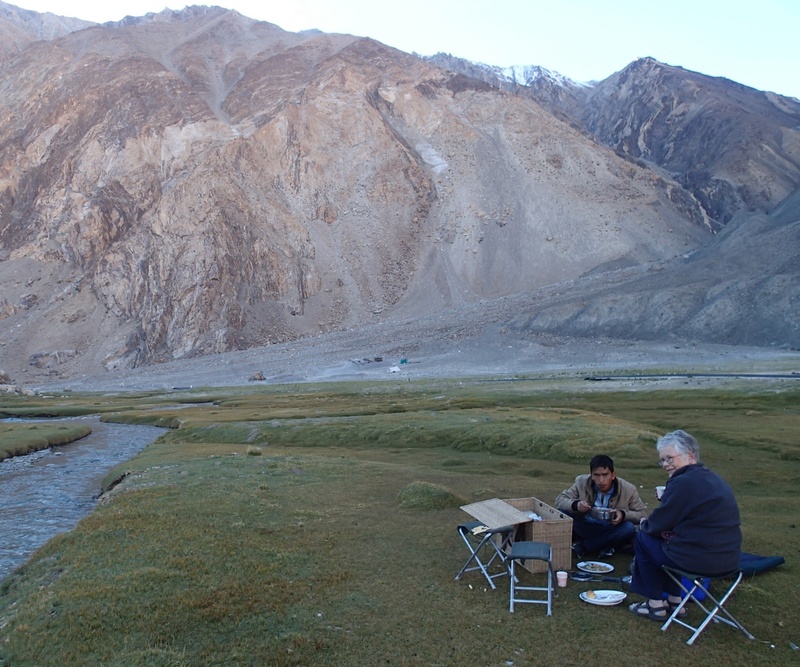 We picnic at top of the pass before Zoji La amidst more spectacular scenery – I’m worried I’m getting a bit blasé about my surroundings! 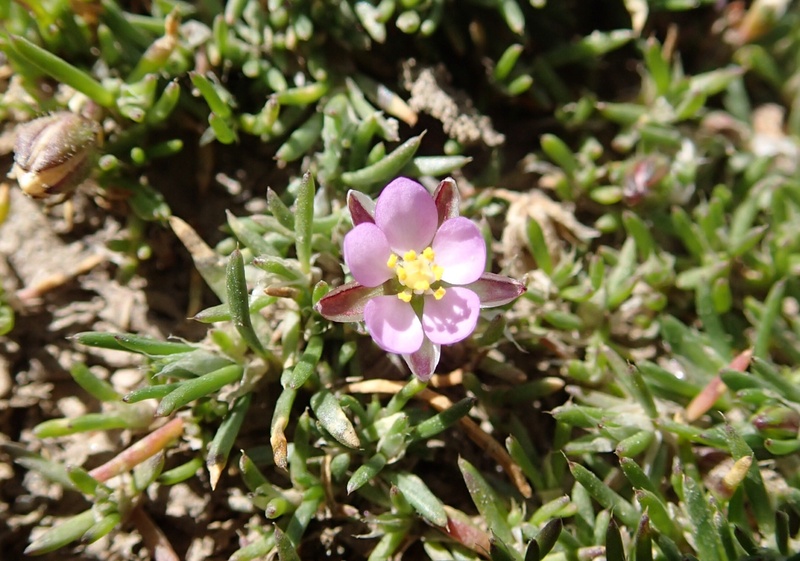 Now the bare ground of Western Ladakh has largely been replaced by alpine type closed cropped vegetation – a tiny white-flowered cress and pink-flowered saxifrage predominate here. And now I remember…. the descent down Zoji La is terrifying. The narrow road snakes down the sheer face of the mountain – it doesn’t help that you can see the bends to come from some distance away! The road surface is very bumpy, sometimes with water flowing across it, and there is often not room for two vehicles to pass comfortably. Unfortunately, because the road was closed last week, there are lots of trucks coming up in the opposite direction to us. It’s a good thing we are so confident in Tashi’s skills! Helen is sitting in front today and does better than I would have, I think. As compensation, the views down into Kashmir are spectacular. Trees, mostly pine and the white birch for which the area is famous, hang on all over cliff faces and the birch are starting to show their gorgeous autumn hues. 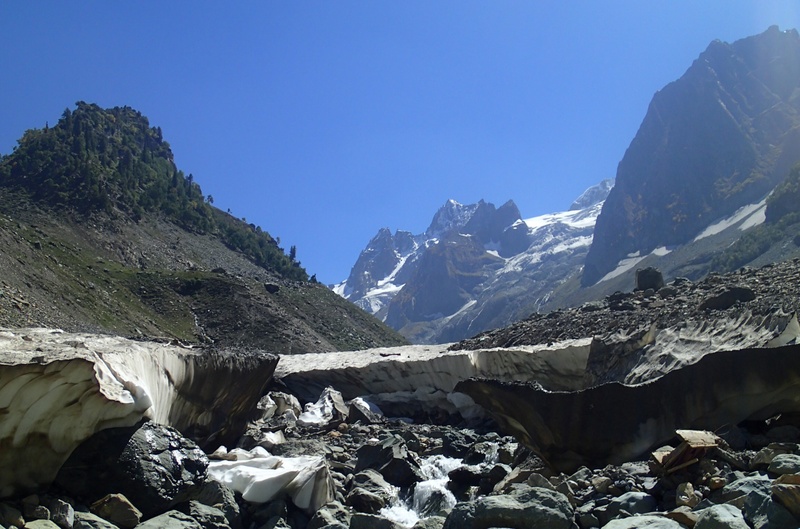 After we descend, we follow the river Sindh for a short distance before arriving at Sonamarg. The first things that strike us are the big military presence and the enormous number of new hotels being built. At the hotel, Snowland Resort, we meet Tahir – Yasin has sent him to accompany us for the rest of our trip. He works for the charity SOS wildlife, as well as leading adventure holidays. The hotel is nice, right next to the river and we are back to lovely mountain views, but there is no hot water or electricity till 6pm. Tahir takes us for a walk, first to old village then to the market and we all enjoy the chance to stretch our legs. As we walk, Tahir is continuously hailed by local people, apparently asking where he got us from! 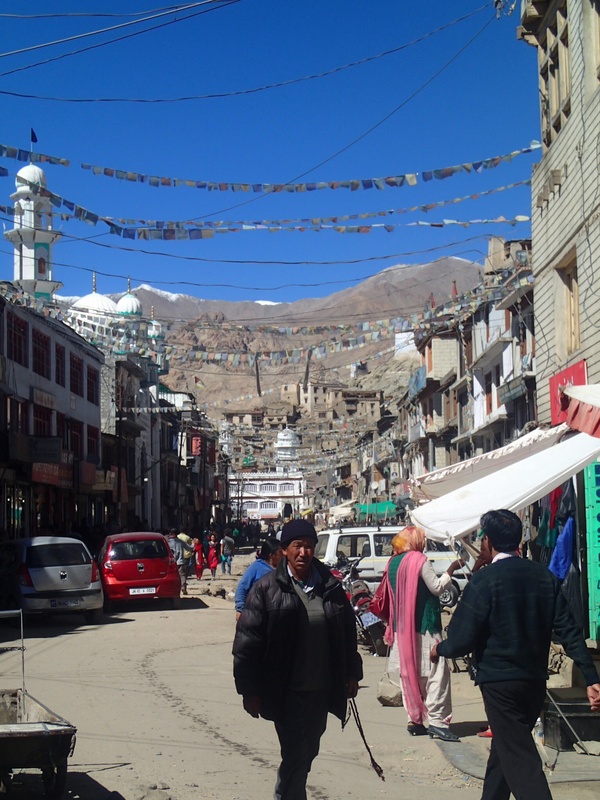 There are no tourists around here at the moment and, as at Kargil, people are a bit desperate. We are the only people in the restaurant for dinner and the food is good though the menu is limited, understandably, because of things not coming through from Srinagar. 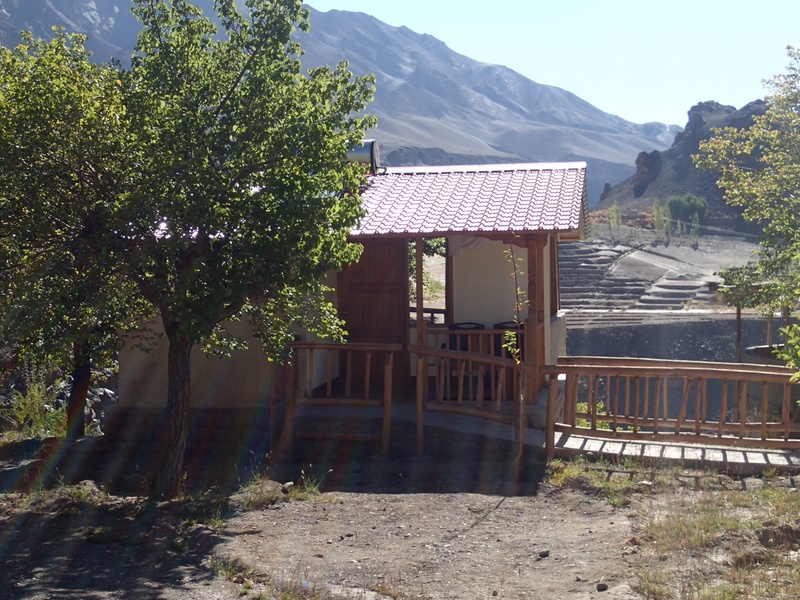 I slept really well last night and enjoy the sunrise through my chalet window – another room with a fabulous view – then walk down a steep slope to the Indus. We are at about the same altitude as Leh here so it’s reassuring to find that I can manage the climb back up fairly easily, albeit with pauses. Breakfast is the usual sort of buffet, but with the added bonus of some delicious apricot juice and jam produced from the trees which dot the resort. The only other people here seem to be a group of French trekkers, though there are quite a lot of permanent tents and chalets. It seems a shame to be leaving early as this is such a beautiful spot. If we’d been travelling from Srinagar to Leh, as originally planned, we’d have had a full morning here before the short drive to Leh. Hopefully next year…. We leave about 9.30 and drive on towards Srinagar. 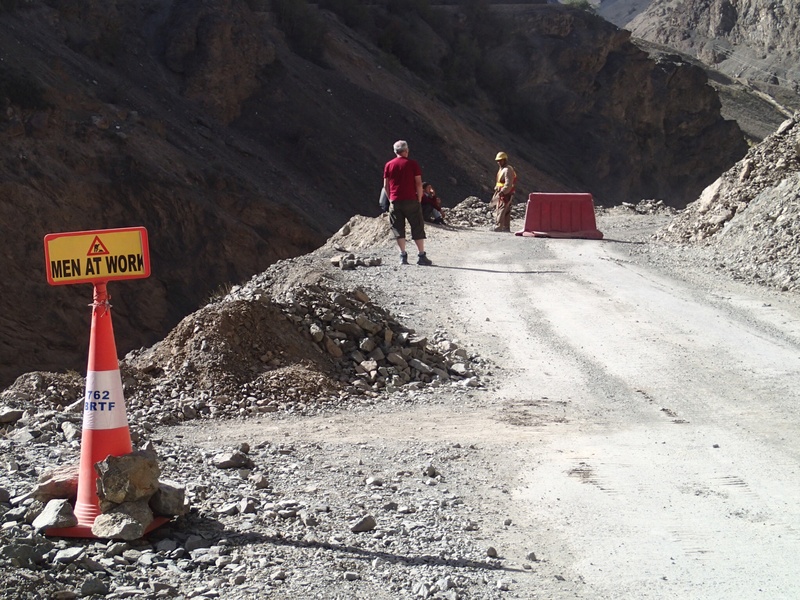 At first the road takes us along the Indus but then we cross and leave it after Khaltse. Now we really are en route to Kashmir. 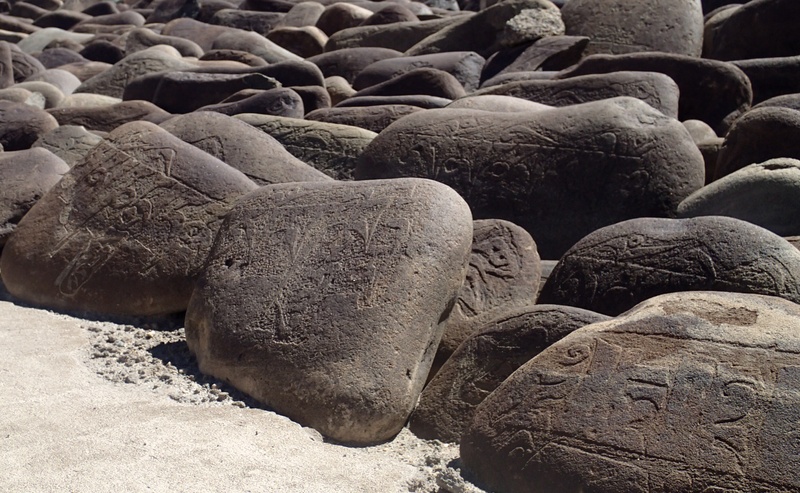 We have been told we might see children selling fossils at Kaltse but see no sign of this, unfortunately, and Tashi doesn’t really know what we are talking about when we try to explain. At one point we see a JCB in the river, obviously having come a cropper whilst carrying out road repairs, which is a bit worrying! 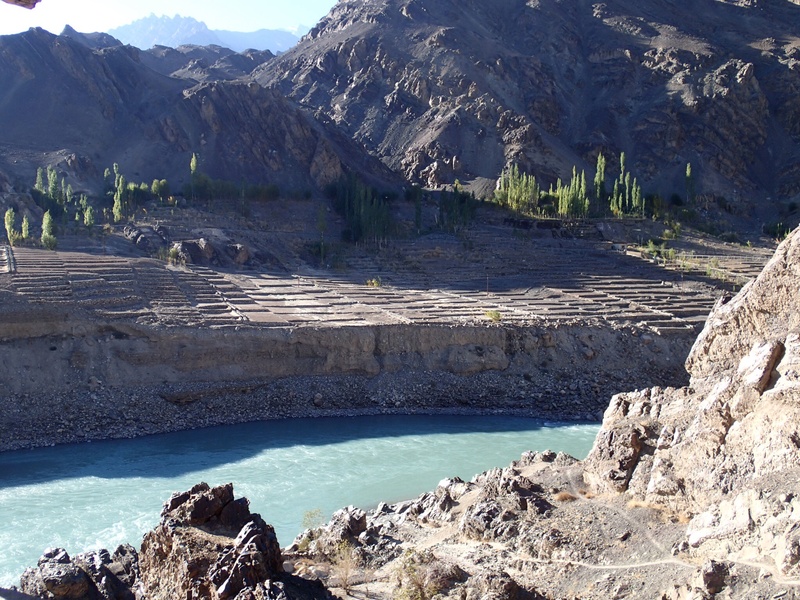 After leaving the Indus we travel up the narrow gorge of a tributary towards Lamayuru, passing through the amazing landscape known as ‘Moonland’. This is a deeply eroded remains of the sediments which formed the bottom of a vast lake which used to occupy this area, before it was drained by tectonic movements. 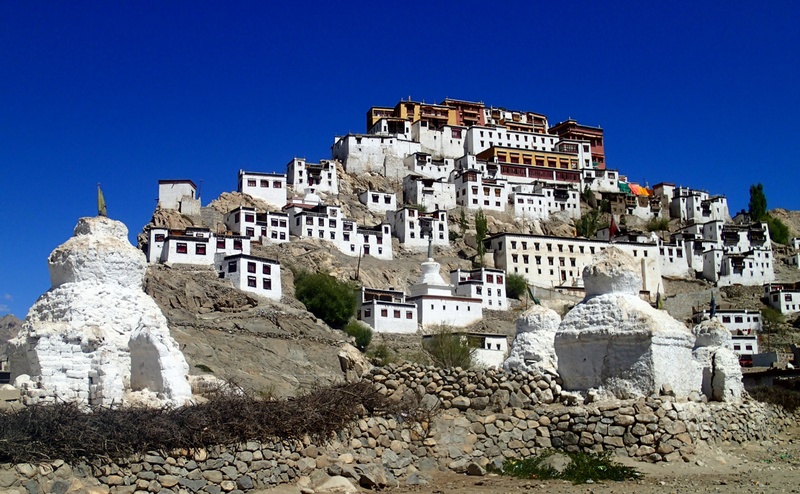 We stop at Lamayuru monastery, the oldest in Ladakh, which was founded in the 11th Century. At this stage the lake was still here – quite a thought. We get good views of the lake remains from the monastery walls. As most of the monasteries are perched on hill sides they do tend to provide great vantage points for looking at the geology, quite apart from their cultural and religious interest. It’s great having Tashi with us to explain what we are seeing. 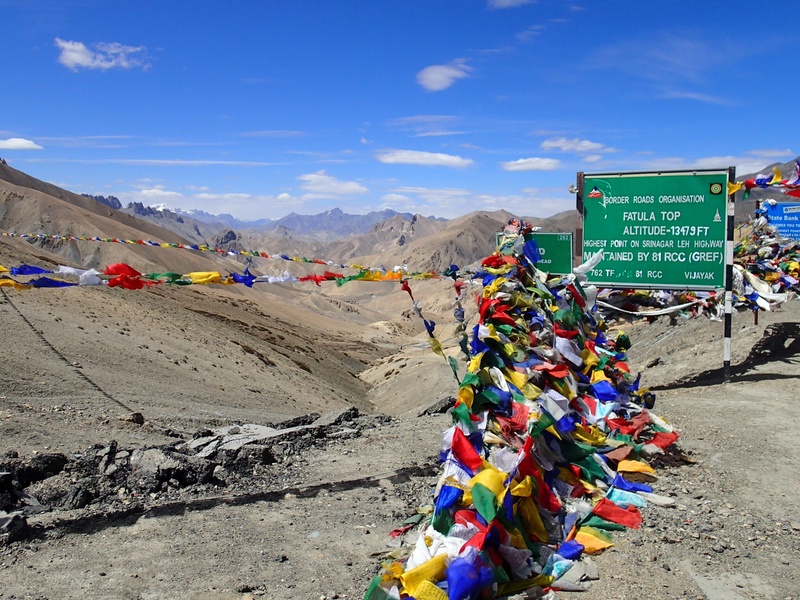 From Lamayuru we drive on over the Fotu La pass – the highest on the route. 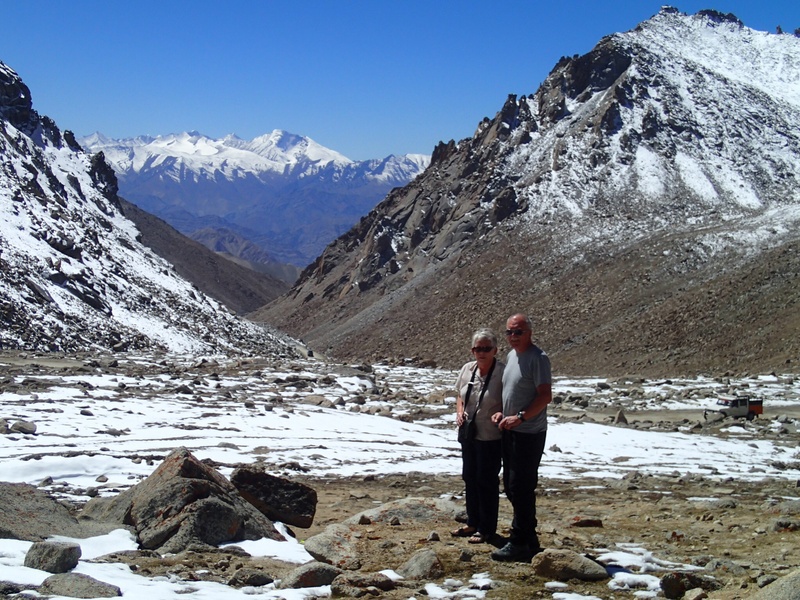 It feels fine, however, after our adventures en route to Pangong, as it is only around 13 000 ft high. The views are spectacular, none the less. We then cross the second, lower, Namika La pass and carry on down to Mulbek. Here we have our picnic lunch and use the facilities in a cafe opposite the monastery. 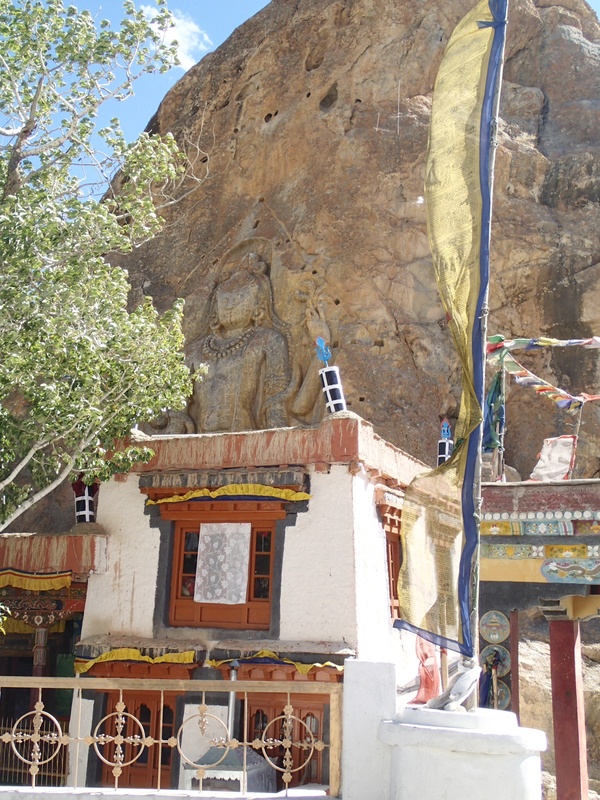 This is built around an ancient, 9 m high Maitreya Buddha carved into one of the huge pillars which are a feature of the edges of the river flood plain here. Many look quite like meerkats on their hind legs to me! Unfortunately, I get stung on the neck by a wasp while we eat. 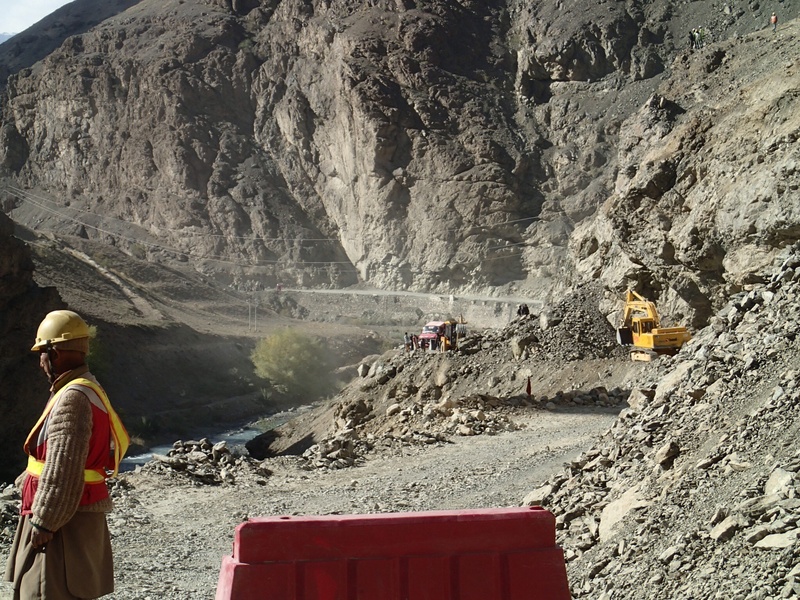 Many of the Indus tributaries we drive along today are dry – Tashi says they will have water in during the monsoon. We wonder whether they are dry more of the time now than they were in the past as they are marked as proper rivers on our maps. Not long after Mulbek, on a much rougher section of the road, we join a shortish queue of stationary traffic. When we get out and investigate it’s clear it’s not going to be a short wait – it turns out to be about 90 minutes, but this is a lot better than last time I got stuck behind a landslide on this road…. Then we were in a rickety bus and had to sleep on it overnight while men with shovels cleared the debris. This time, apparently, they are doing road improvements. 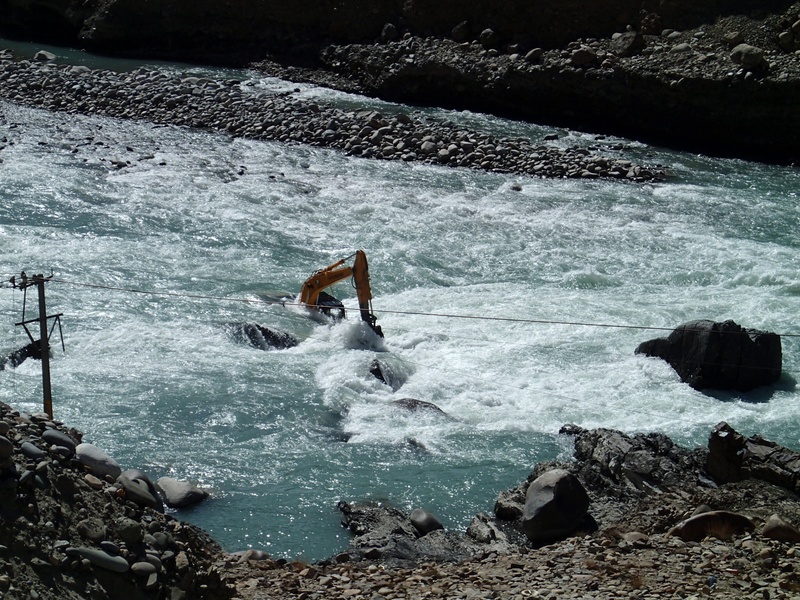 They have blasted material from an overhanging rock and are clearing it down into the river gorge using two diggers. The road is, on the whole, certainly much better (wider and less terrifying) than I remember and Tashi says this has mostly been done over the last five or six years. It’s very dusty on this section of the road though, which doesn’t have a tarmac finish. This cloud has silver linings though – we get to stretch our legs and potter around the piles of sedimentary rocks at the roadside looking for fossils, though we don’t find any convincing ones. John thinks these may be very deep ocean sediments, which would make fossils much less likely. A trio of beautifully-dressed small girls practice their limited phrases of English on us and allow us to take their photos. They ask for chocolate and we remember Danish’s goody bags. When we bring some chocolate biscuits back to the girls we are rewarded with huge smiles! When we do get past the hold up we realise how lucky we are to be going this direction – the queue of vehicles going towards Mulbek is enormous, with cars and trucks double parked along the road for some distance. 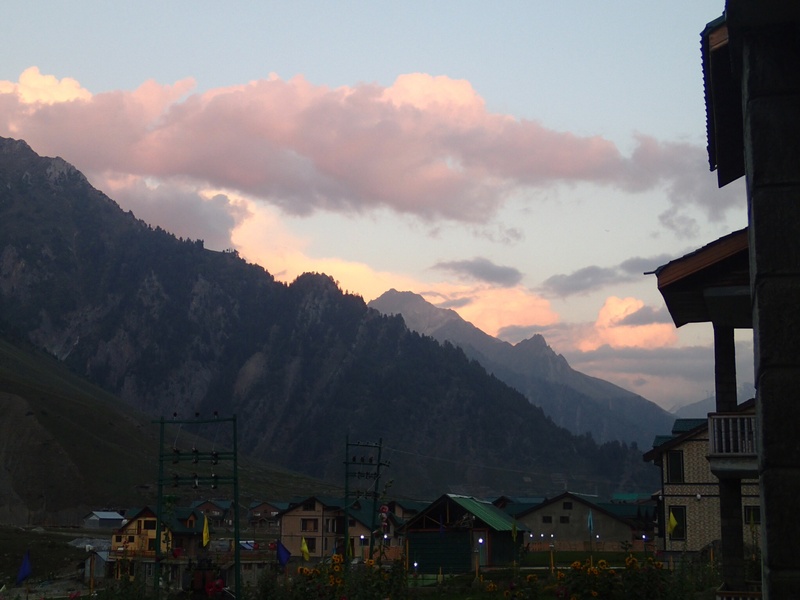 It’s not far from here to Kargil, fortunately, and we arrive more or less at dusk. 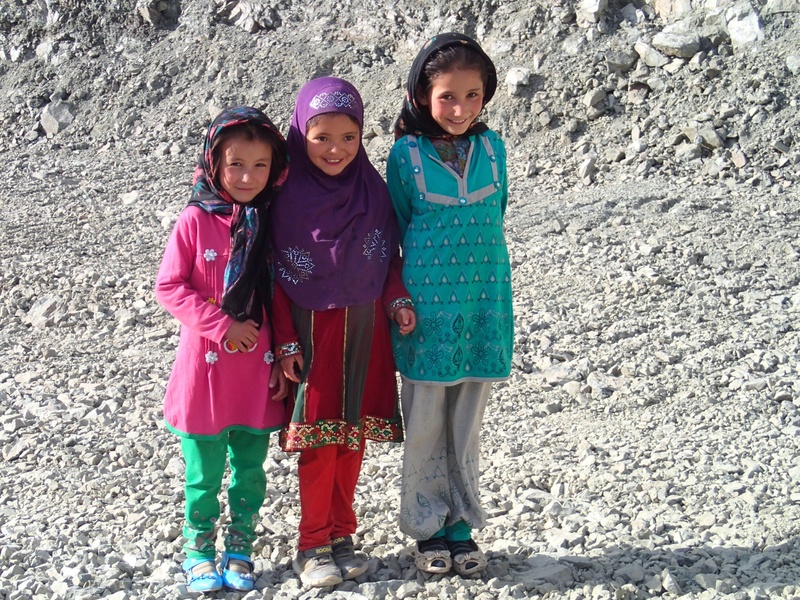 Kargil is set against the spectacular backdrop of the Pakistani Karakorams but has llittle otherwise to recommend it. Our hotel is just by the river Suru but a much less romantic setting than last night, just by a big hydroelectric dam. We’ve been rather spoiled with the views till now! The Zojila Residency hotel is fine and the staff friendly but the north-facing rooms are big, echoey and a bit cold and we have to wait till 6.30pm for hot water. John and I spend the intervening time trying to work out which rocks we went through today and what we will see tomorrow en route to Sonamarg. I’m disappointed to find no wifi here as I’ve been faithfully writing my blog, as I promised Yasin, but am unable to publish it. The hot water is worth it when it arrives and we all feel better after showering. We are more or less the only people in the large dining room but tuck ourselves in a corner so it doesn’t feel so odd. There is a large television on showing Bollywood films and John is entertained by the young man who comes in eat with a girlfriend and spends most of the time turning round to watch TV rather than talking to her! The food is again good – a selection of curries. We are in Muslim territory now and, when we arrived, the manager asked if we’d like beer with our meal. When we said yes, it was clear someone would be sent out to buy us a four pack of tinnies and, sure enough, that’s what we get. Can’t fault the staff on effort! 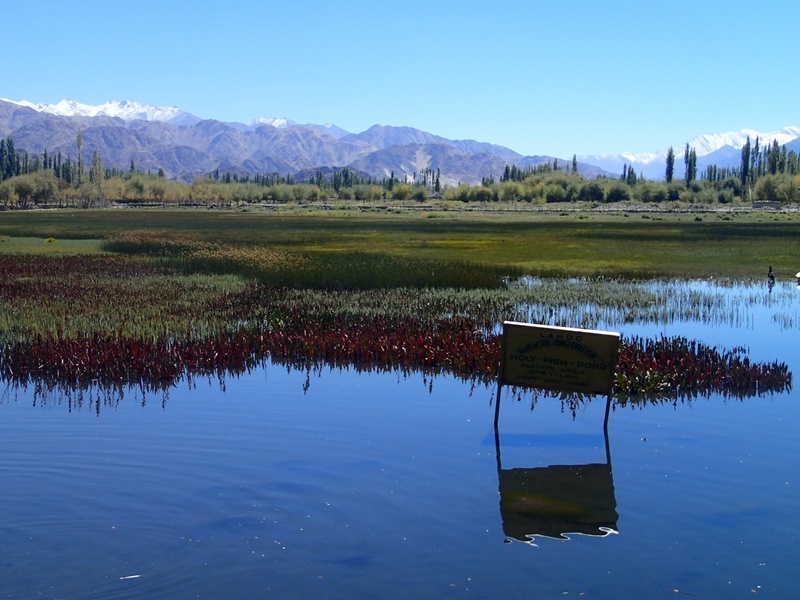 We do feel sorry for the manager – he was clearly a bit desperate for custom and very chatty, telling us he was forced to open a month late this year, because of snow, and that now there are no tourists on the road between Srinagar and Leh so he has had lots of cancelled bookings at this end of the season too. I get to see the sun rise over a different set of mountains this morning. In the end I was too warm, having gone to bed with my fleece and thick socks on! A steaming bucket full of hot water arrives in each room at 7am but John is the only one who braves a proper bucket bath – Helen and I decide the air temperature is too low for that. Tashi is keen to get away fairly early this morning so we walk down to the lake and I collect a diatom sample for Martyn. I hope it’s appreciated – there is ice on the little stream flowing into the lake this morning and the water temperature is low. There is definitely something growing on the rocks though – I hope it’s diatoms! 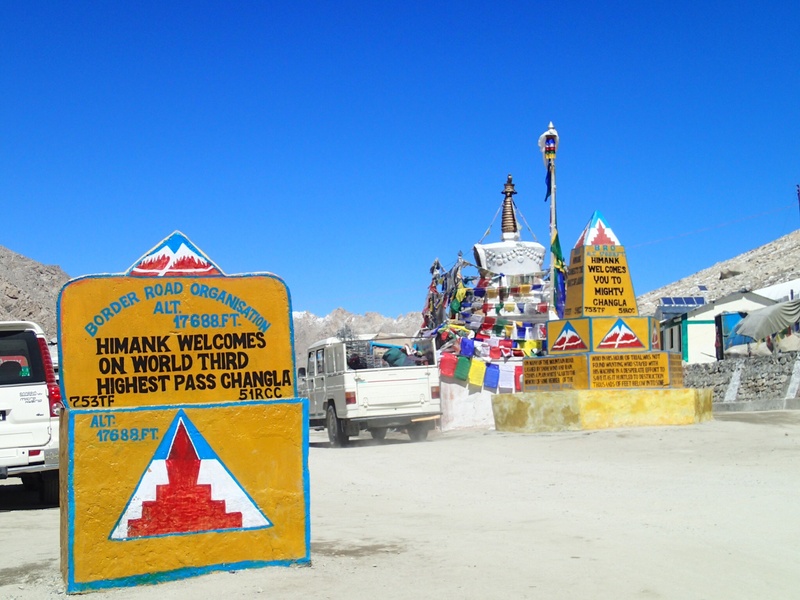 Because we have a lot of ground to cover, we drive straight back to Leh, with only a brief stop at Chang La for toilets. 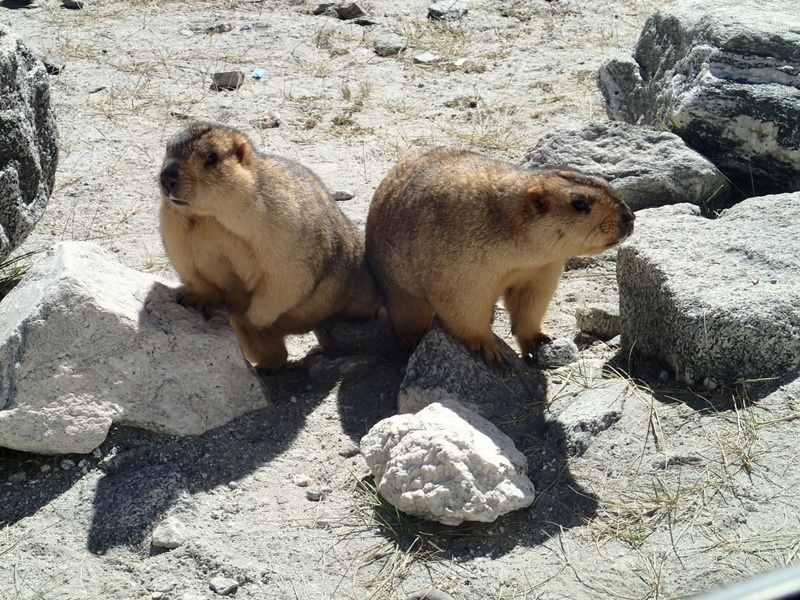 The journey back is enlivened by seeing, first, a group of wild asses and, secondly, some very tame marmots. The latter are obviously used to humans, and perhaps to being fed, and approach the car when we stop. To Tashi’s excitement, one more or less tries to climb into the car! As a devout Buddhist, it’s clear he has a great compassion towards animals, as well as fellow humans – a lovely man. We are back at the Grand Dragon hotel early afternoon for lunch and they kindly give us room keys so we can shower. I talk to Danish and Yasin about what happens next. 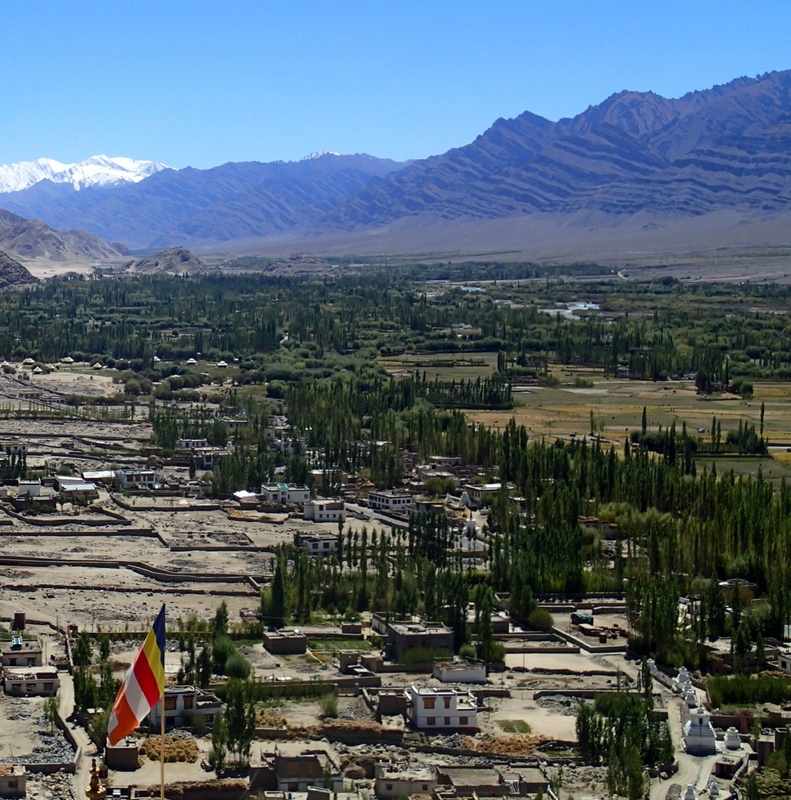 We had wondered about asking to stay in Leh another night but it turns out there is some kind of strike on tomorrow which means we’d have to leave Leh before 6 am to get to Uletokpo. This doesn’t seem like much of a plan so we leave around 5 pm for Uletokpo, armed with goodie baskets from Danish. 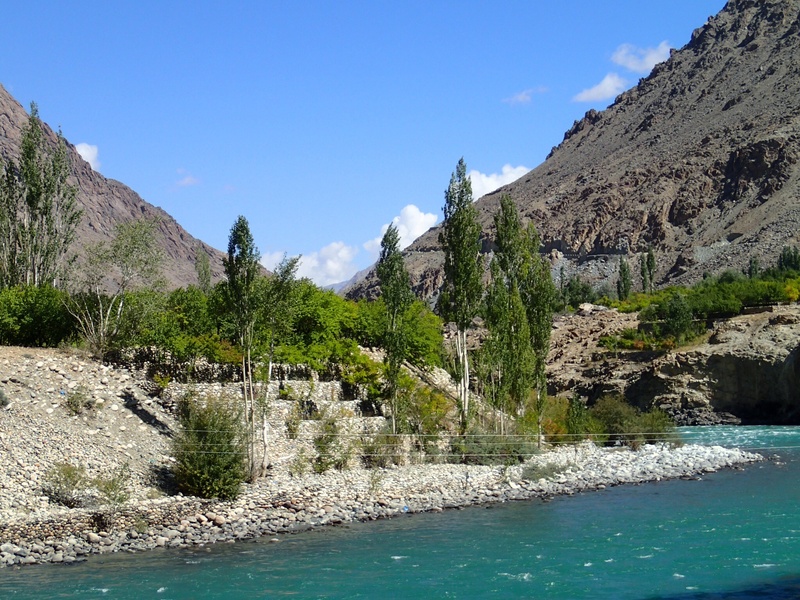 We drive past the point where the Zanskar river joins the Indus and along the Indus to near Saspol where we are to stay at the Uletokpo Eco Resort. We arrive just at dusk at an amazing location on a cliff, immediately above the Indus. A pity it’s nearly dark as it would have been good to explore. On our itinerary this is described as a ‘tented camp’ but we turn out to be in rather swish little chalets – no complaints! Dinner is another tasty buffet and the bossy head waiter provides the cabaret. There is time for some star gazing and a quick game of Scrabble before bed. 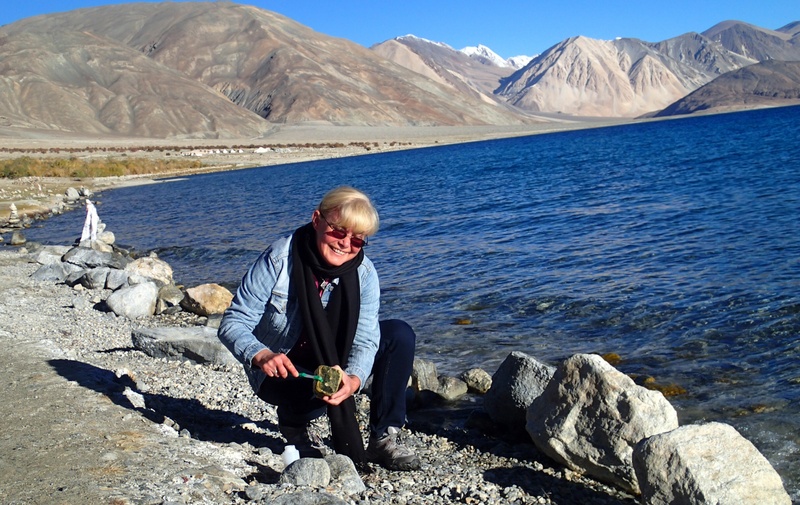 We have packed overnight bags for an overnight stay at Pangong but take our cases anyway – poor Tashi has a task to pack everything into the boot, given that we also seem to be carrying an extra large picnic. Danish is worried we won’t be properly fed and looked after at Pangong but I suspect it will be more the type of place we are all used to! Today feels much cooler – very pleasant. When we ask Tashi the temperature, expecting there to be a thermometer on the dashboard, he waves his arm out the window and announces confidently it is between 12 and 15 Celsius though, as always, it feels warmer in the rarefied air. Our first stop is on the main road at Igu. This time, John is able to identify the contact between the Granitoid batholiths and Indus Molasse on either side of the suture easily. At Karu we have to show our passports and permits before we can cross into the army controlled zone but Tashi deals with this, and all proceeds smoothly. 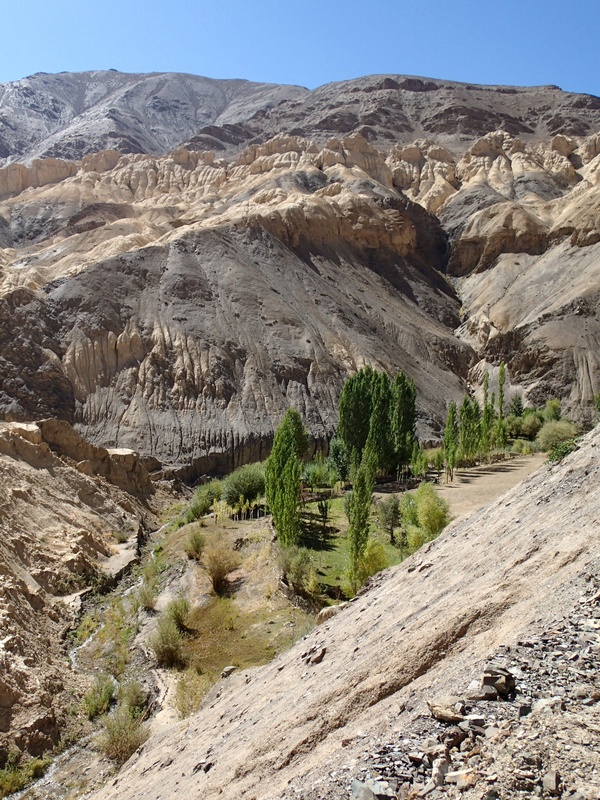 From here we head off northwards into the mountains, at first in a flat side valley off the Indus past Chemre monastery. The contrast between the green, terraced valley bottom and the steep, bone-dry mountains is stark. 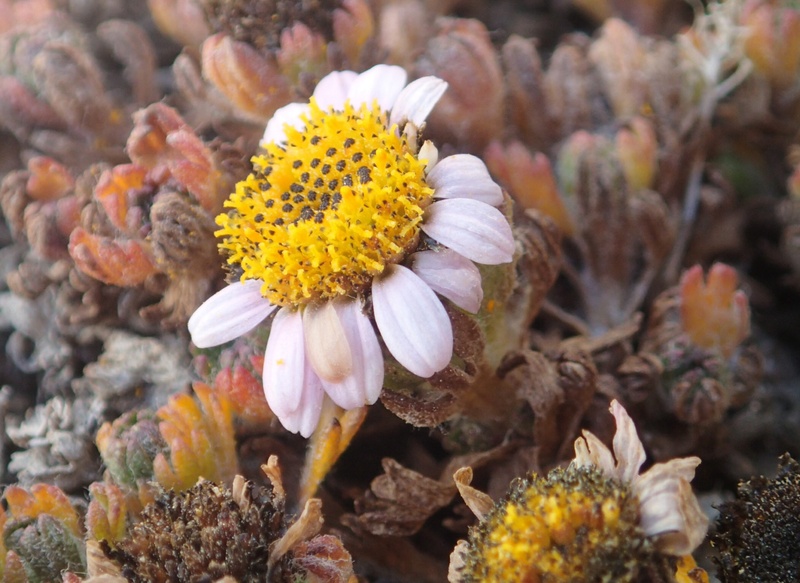 Soon the road starts to climb, zig-zagging across the face of the mountains for maybe 20 km until we finally reach the top of Chang La Pass at 17688 ft. We are just about on the snow line here, as John demonstrates when I am bending down photographing flowers and lichens! The views are superb but the air is very thin and we probably spend a bit longer than we should here. 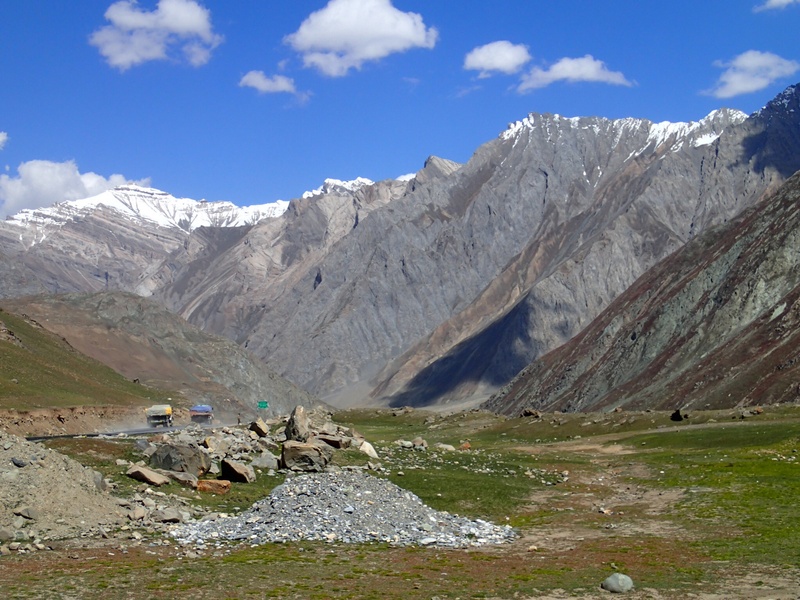 We drop down below Tangtse for lunch – from here it is a fairly flat 30 km or so to Pangong and we are amidst some spectacular gneiss mountains. The sun is leaving the valley fast and there is quite a breeze so we eat our biryani quickly – much more like normal UK picnic conditions! 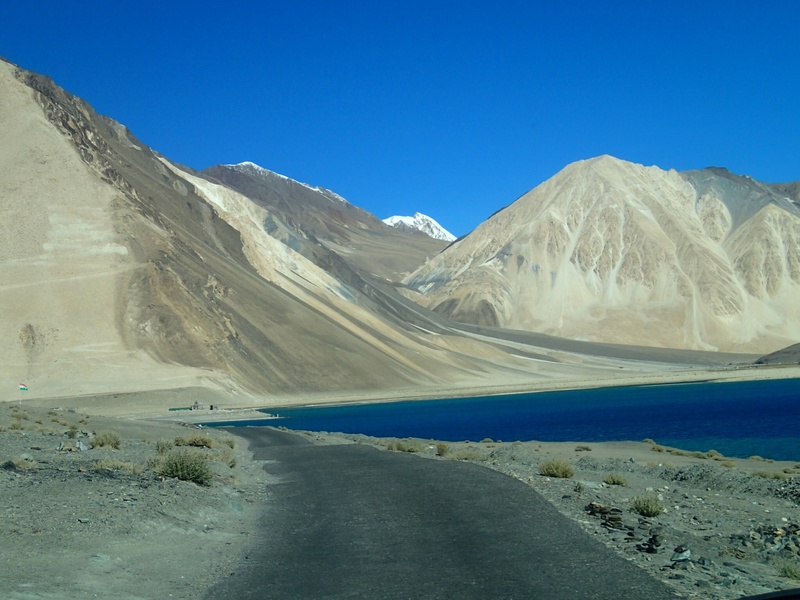 We drive through the very impressive remains of a glacier before Pangong Tso. This is textbook geology – a glacier lake, moraines and glacial erratics. In fact, today’s route is a great way to get a clear picture of the whole rock cycle in action. 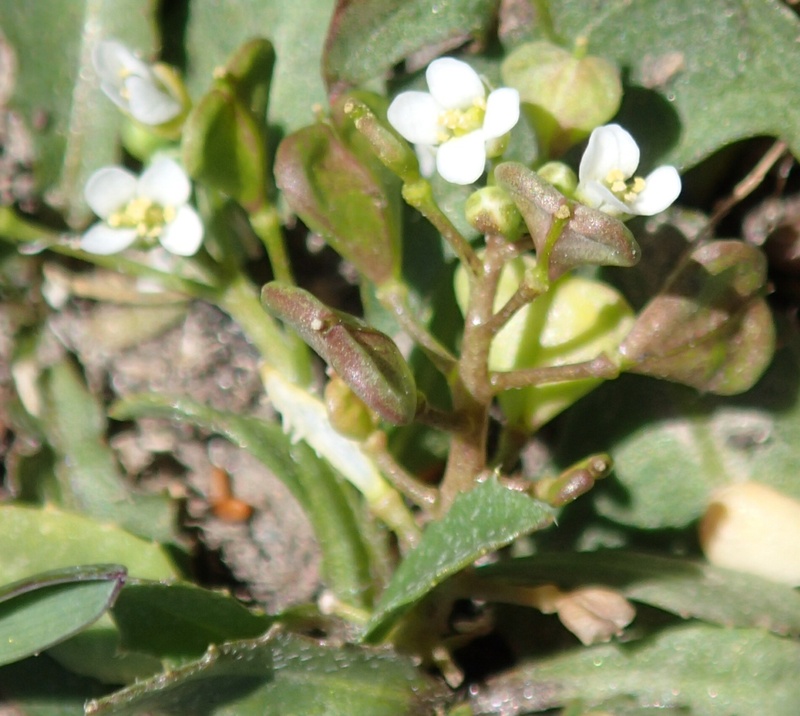 There are obvious salt deposits in the bottom of the valley where evaporating water has pulled these to the surface and these no doubt affect the plants that grow here, though there isn’t really time to stop and look today. 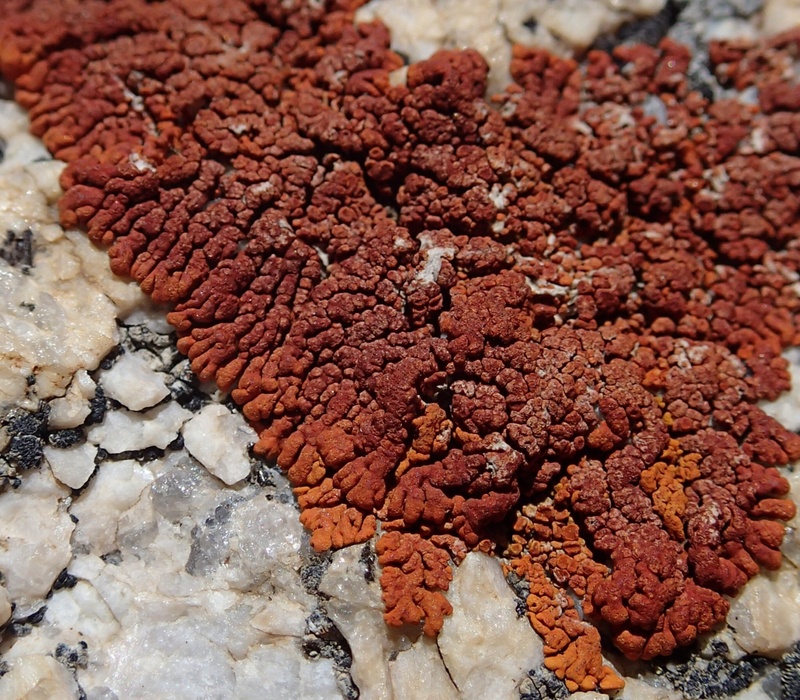 The other interesting adaptation is the bright red hue of many of the plants growing at this altitude, including the lichens. 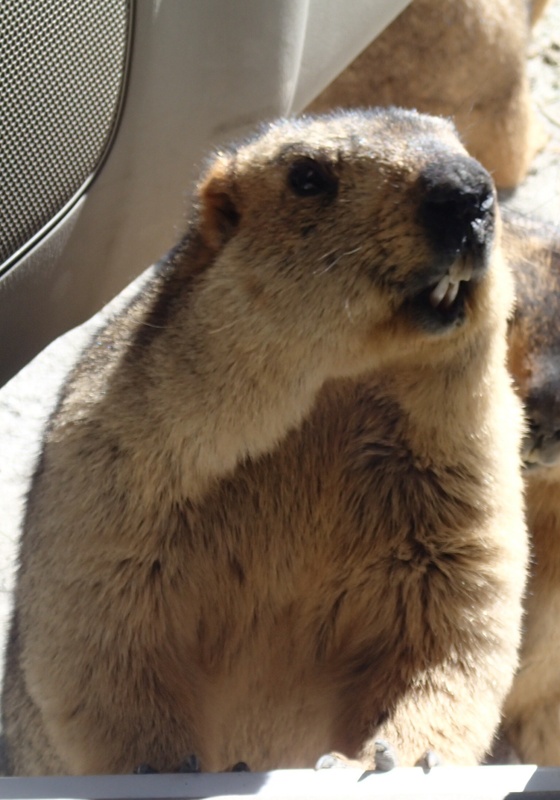 They have their own built in sunscreen in the form of carotenoid pigments. 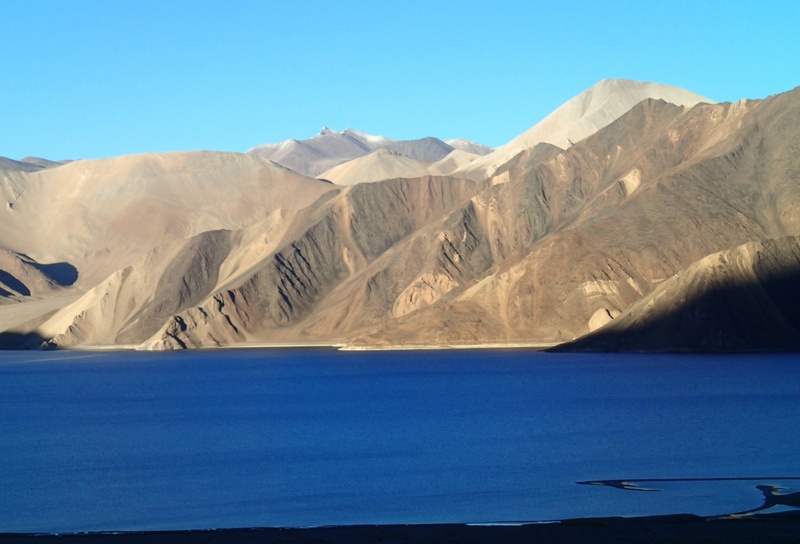 Our first glimpse of Pangong lake in the last of the sun is spectacular – an unbelievable blue against a backdrop of marbled mountains. Tashi points out that the mountains we see at the far end of the lake are in Tibet. 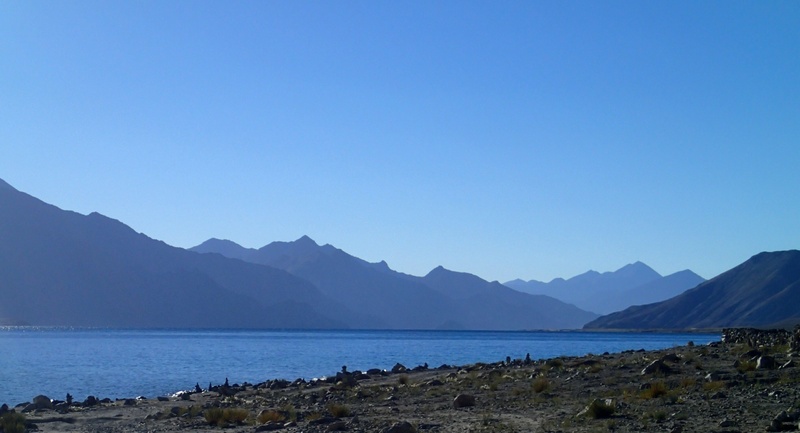 We drive along the lake for a few km to Pangong Resort where we are relieved to find we have rooms in the building rather than one of the many tents dotted around. These would be lovely in summer, but it’s distinctly chilly this evening. The two duvets on each bed gives us a clue of what to expect! We have a welcome cup of tea, then Helen and I take a short walk down to the lake to scope out a diatom sampling site for tomorrow morning in the last of the sun’s glow. Dinner is a buffet, as seems the norm, but there is plenty of good food on offer so I’m not quite sure why Danish was concerned. The accommodation is basic but fine and the staff friendly. After dinner we wrap up warmly and venture out again to have a look at the stars. The Milky Way is clearly visible and the plethora of stars incredibly twinkly in the clear air. We are up at around 14 000 ft tonight and it’s noticeably harder to multitask – walking and talking is something of a problem! 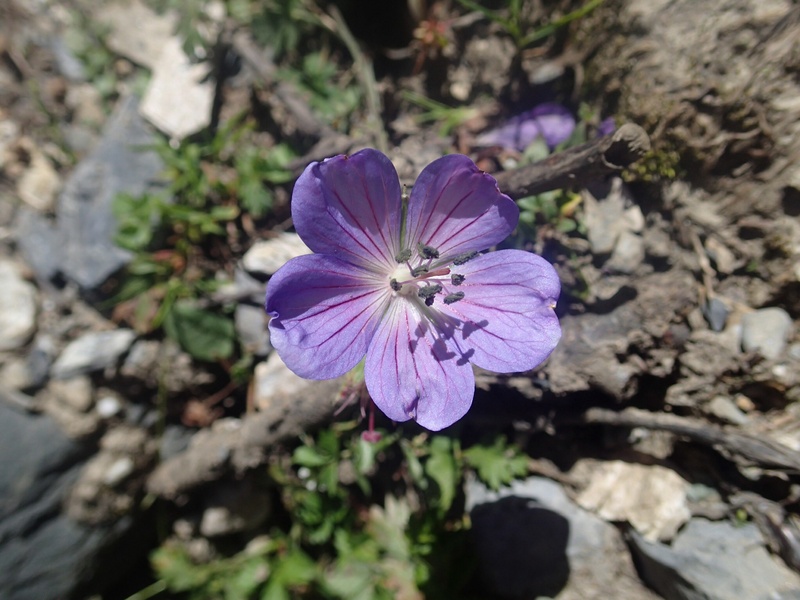 Because we are all feeling tired we decide on a gentler day today, foregoing the Khardang La pass in favour of a trip to the palace at Shey and some time in Leh – it may be our last chance for this. 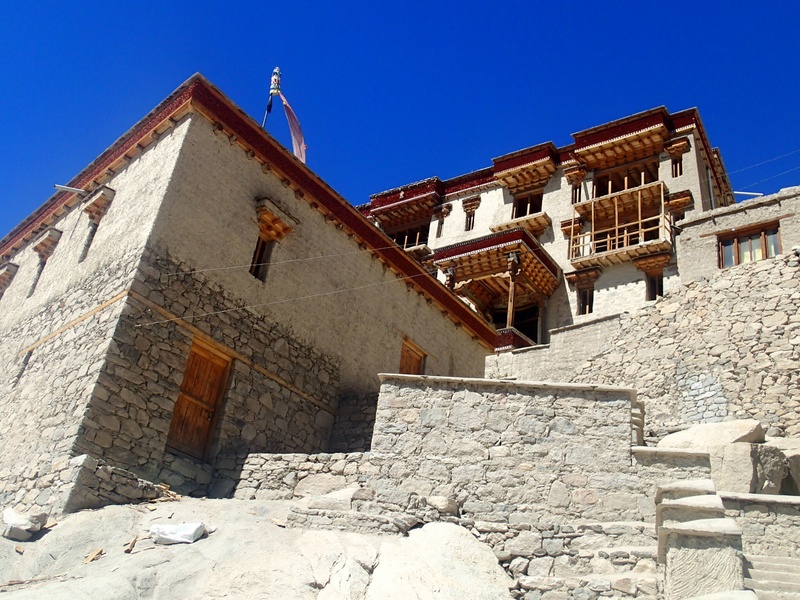 Shey Palace, 15 km east of Leh, was a royal palace until the 16th century but is now home to just one monk, who looks after the shrine. We park at the bottom of the hill and manage the slope and steps up to the monastery but still need frequent breathers on the way – taking photos provides an excellent excuse! 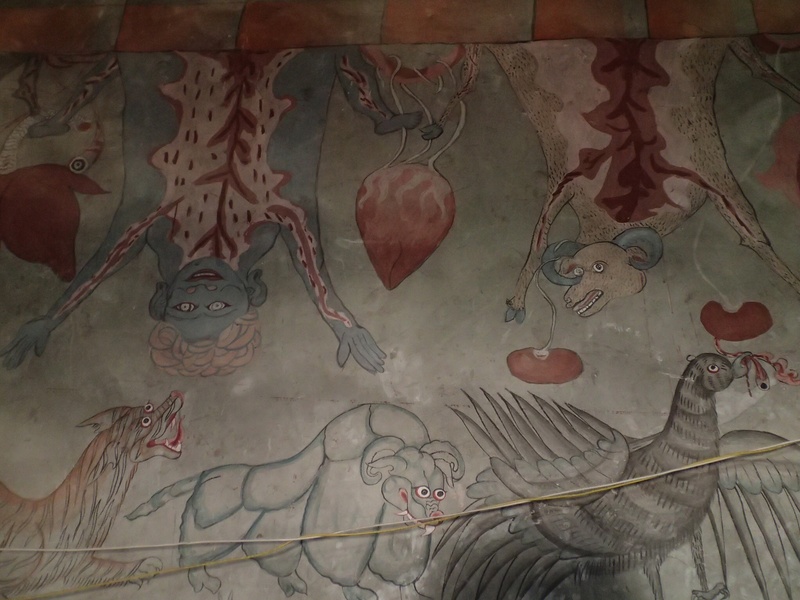 The wall paintings in the shrine, dating from the 16th Century, are very interesting – many of the characters feature haloes and have distinct resemblances to Christian iconography of the time. 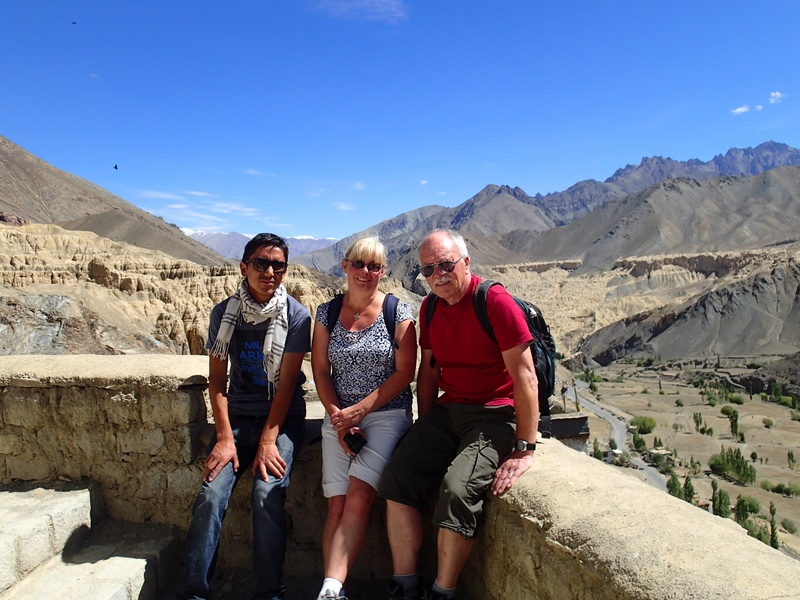 Tashi, John and I climb a little higher to look at the oldest part of the palace – ruins dating back to the 11th Century. These are perched right on top of the hill and seem incredibly inaccessible by modern standards but the views from the top are superb. 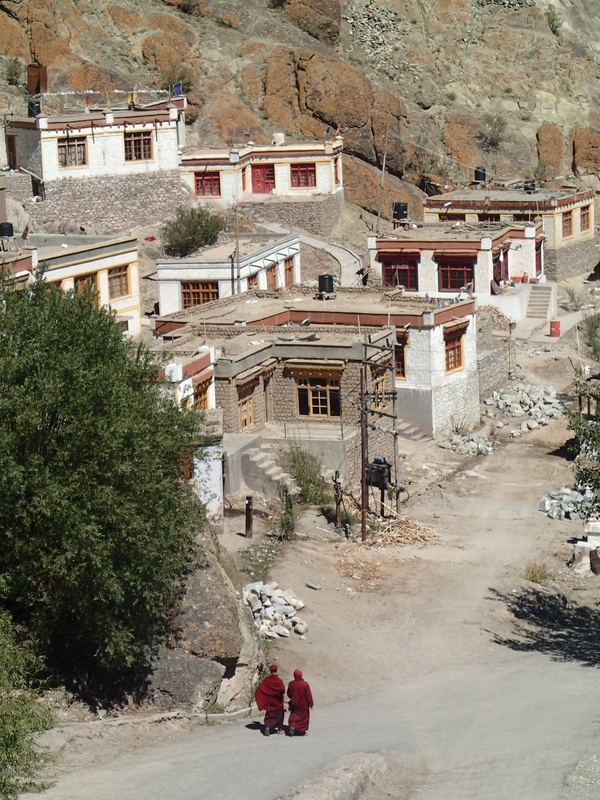 We look down on the remains of an ancient lake bed, now covered in chortens containing the ashes of important monks. Its easy to see where sediments have washed down from the mountains above and infilled the lake. All that remains of it now is the holy fish pond attached to the monastery. This is home to large numbers of carp, as well plenty of water fowl. Tashi drives us a short distance along a bumpy track opposite the monastery to a lovely picnic spot, complete with shady canopies. We have a wander in scrubby woodland there looking for plants but it is a pretty hostile environment – very sandy, albeit with water not far below the surface – and we find mostly thistles, buckthorn and the ubiquitous pollarded willows. 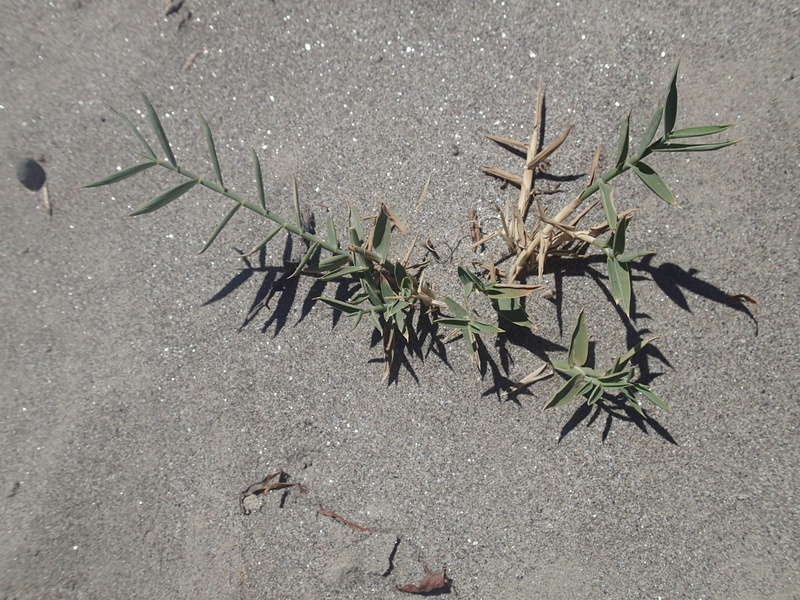 There are some obvious pioneer species too, including a grass which looks very much like a recumbent marram grass, helping to stabilise the sand. Lunch is yet another new experience. 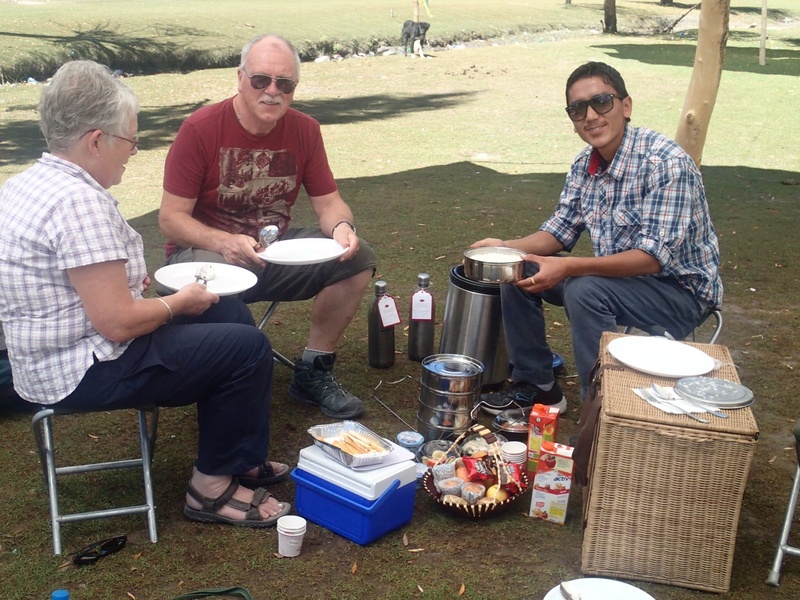 This time an insulated tiffin carrier comes out of the car and, as well as more tasty soup, we are treated to rice, chapatis, chicken and dal – we are certainly picnicking in style. Helen and I feel perhaps we should be wearing floaty dresses and carrying parasols! After lunch, Tashi drops us in Leh town to do some browsing. Our first impression is how unlike Delhi it is – we can wander the streets freely and people may invite us into their shops, but otherwise folk are just going about their business. 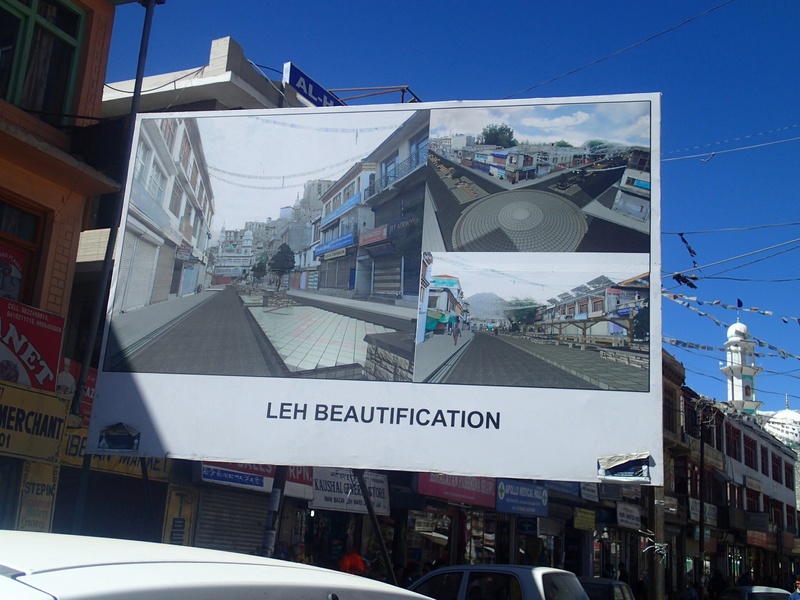 The main market street is currently in the process of being beautified, according to a large signboard, but for now that just means that the middle of it has been completely dug up. There are plenty of shops selling all manner of beautiful fabric items and Tibetan jewellery and we browse in a few, though John is really more interested in the plethora of outdoor gear for sale. Western tourists and trekkers are very obvious in the town. When we find a bookshop, I am very pleased to pick up a copy of Flowers of the Himalya, by Polunin and Stainton. Not long after we leave the bookshop we bump into Tashi, who has come to find John and me and take us to an earlier than expected meeting with Mr Takpa, the chief forest conservation officer for Ladakh. We leave Helen shopping and Tashi takes us to Mr Takpa’s office. It turns out to be an interesting meeting. He is a very dynamic man, responsible for significantly increasing the snow leopard population in Ladakh by helping local people benefit from their presence. He assures us that, if we come back in February, he can guarantee we will see a snow leopard – I like that idea! Mr Takpa is also very helpful in telling us who to contact to take a group into the region’s nature reserves. Afterwards, Tashi drops John and I back up the hill into Leh. We reckon Helen has probably finished her shopping by now but I need to go to the bank and buy a few gifts. John nobly accompanies me – above and beyond the call of duty – but I reckon he probably has it easier than if he was accompanying both Helen and me! CP Dorjay has invited us out for dinner at a local restaurant, The Tibetan Kitchen, but before we meet him Danish calls in to talk to us about our plans for next week. 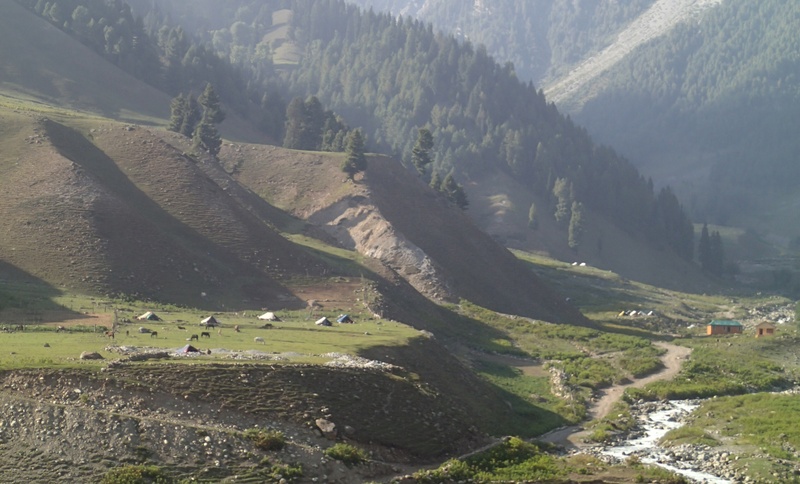 It looks like the best option may be to spend an extra night in Sonamarg and then a couple of nights on the outskirts of Srinagar, before heading to the airport. We’ll make a final decision on our return from Panng Lake on Friday. We have a really lovely evening with CP. The food is excellent; chicken tikka mossala and Afghani kebabs, for our benefit, as well as Tibetan thukpe soup and mo mo (dumplings). The conversation is equally good and we learn a lot about the history and politics of the relationship between Ladakh and Kashmir and about family life and the education, as well as how climate change is affecting the already-fragile relationship between man and his environment in Ladakh. CP is such a warm and friendly host and we look forward to seeing him again next year. I’m awake so early I sneak down for a cup of chai and first round of breakfast before John and Helen surface, then sit In the garden in the sun reading. It feels much warmer than yesterday already, with a fantastic, cloudless sky. I am joined by the two ladies in Ladhaki dress who greeted us yesterday, who sit on a swing seat enjoying the peace and sunshine between greeting people coming in on the morning flights. Poor John is still struggling with a headache and I don’t think the sight of Helen and I enjoying dal for breakfast helps much! 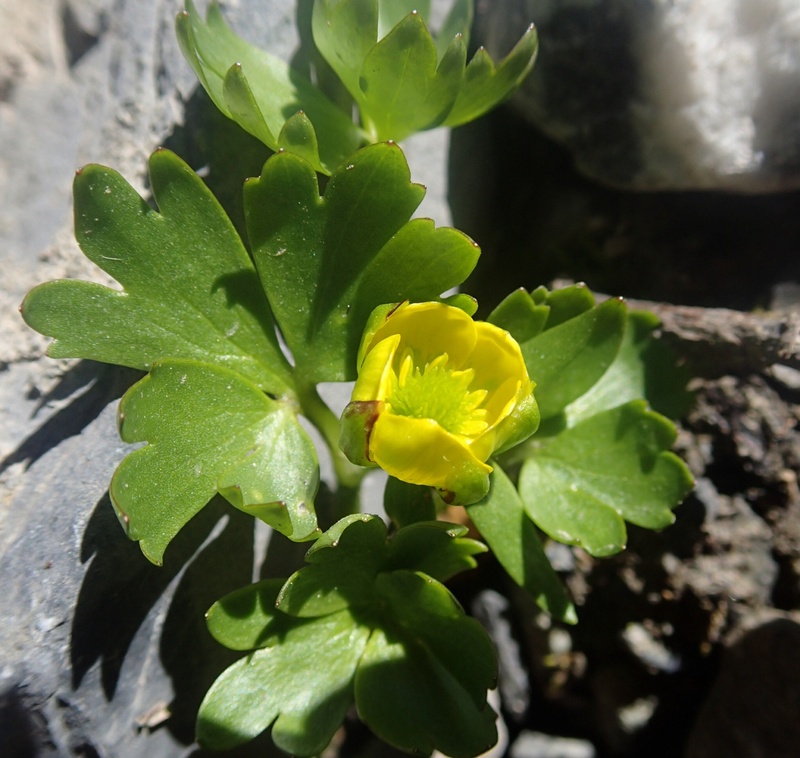 Danish, Yasin’s right hand man in Leh, comes to meet us this morning and gets the hotel to produce for each of us a little sachet of a local altitude sickness remedy to carry around – eucalyptus tablets and cloves. It is certainly effective in clearing my nose, which feels very stuffy in the dry atmosphere. He has arranged for the hotel to supply a picnic for us today which, judging by the size of the wicker picnic hamper, is going to be quite something! We are introduced properly to the driver, another Tashi, who will be with us now for nearly the whole trip. He is very friendly and helpful and, usefully for us, speaks good English. 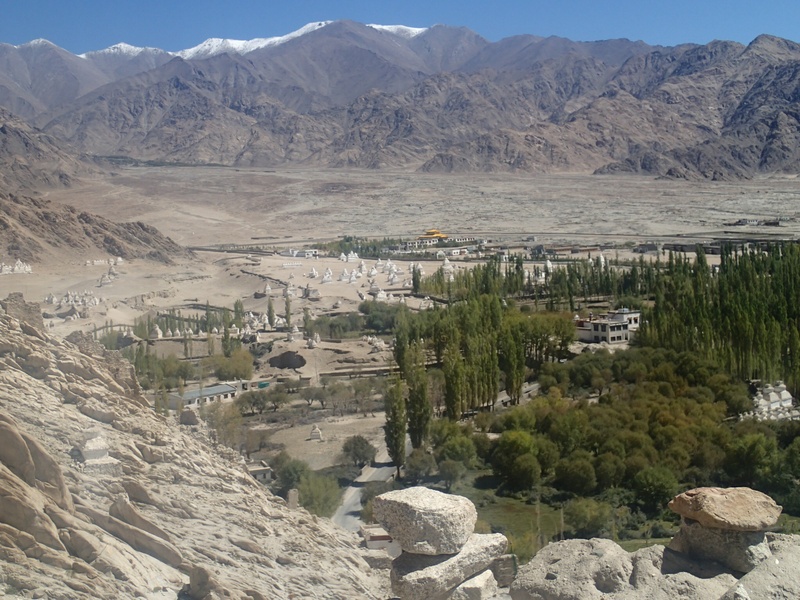 Our first stop today is Thiksey monastery, perched above the Indus valley some 25 km south of Leh along the Manali road. As we drive, Tashi explains to us about the stupas, in various styles and states of repair, which line the route. The oldest date from the 16th Century and all are whitewashed every year by those who live nearby. We stop at the bottom of the road up to the monastery to take photos and Tashi explains to us about the stones on the prayer wall, carved with the inscription ‘Om mani padme hum’. The monastery is very old, with rather grisly wall paintings from the 17th century in the room adjoining the main prayer hall. 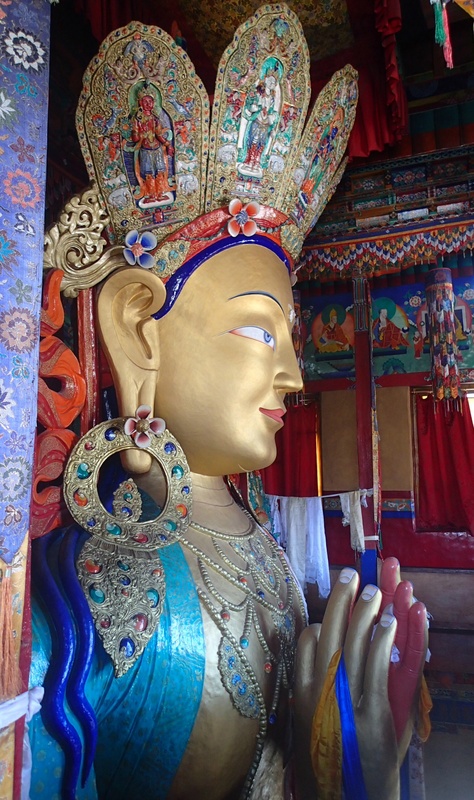 There is a huge new, golden Maitreya or future Buddha in the main temple room, which is decorated very ornately with painted walls, woven hangings and silk scarves brought as offerings. The rooves in the monasteries are supported on mats of twigs, which we soon realise are cut from the pollarded willow trees we see everywhere. Tashi explains that the ends of these are cut in different ways which have religious significance. The views from the roof along the Indus valley are spectacular and John is happy because we get a really clear view of the two rock types on either side of the Indus suture zone here – a great illustration of how we hope to combine geology, ecology and culture on next year’s trip. As we drive, we occasionally ask Tashi to stop the car so we can photograph rock formations or flowers. He always does this with smiling good grace, despite the fact we probably seem bonkers. From Thiksey, we continue along the Indus to Karu, before heading up a windy road towards the Zanskar range and Hemis monastery. This feels very different to Thiksey, hidden away at the head of a narrow gorge on the edge of the Indus Molasse rock formation. The land below the monastery is watered by the stream flowing down the gorge and fodder crops grow on the terraced fields. We see the dried grass stacked on the rooves of houses everywhere, drying out ready for winter. 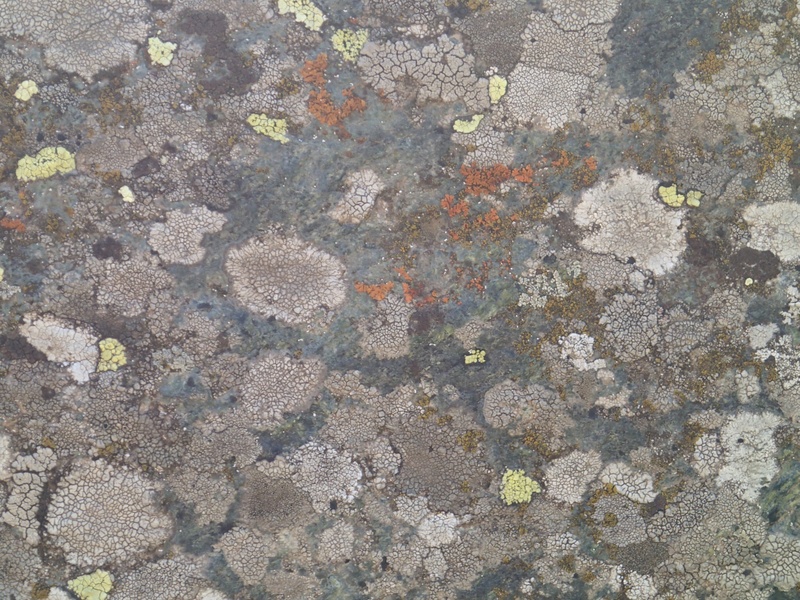 The rocks above the monastery are richly covered in an orange lichen which we hope to get a closer look at later. 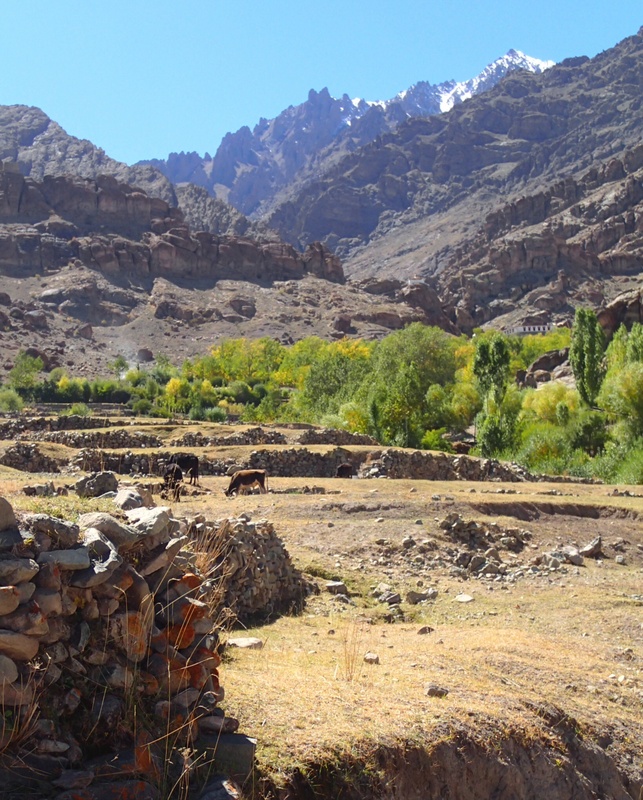 From Hemis, we drive down the valley then across the foothills of the Zanskar range, before heading further up into the mountains for our picnic lunch at Shang Sumdo. 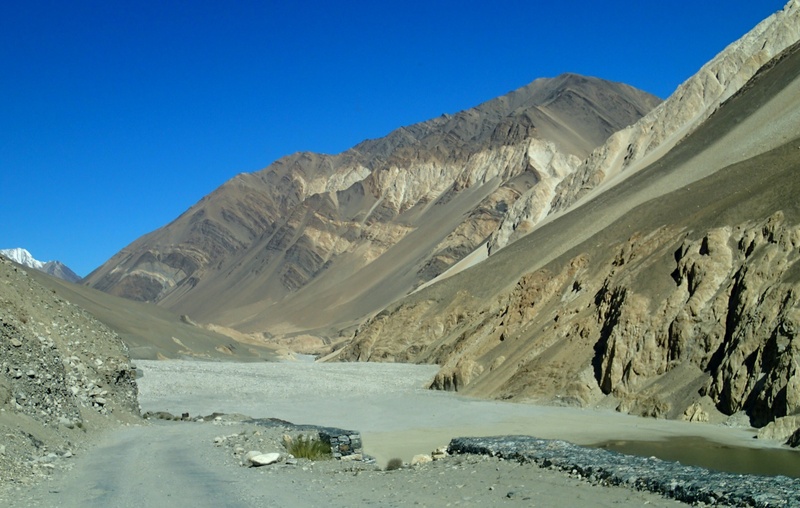 This is a truly spectacular drive over dry river beds and up a very narrow twisty gorge through the contorted sediments of the Indus formation. Erosion has produced spectacular scree slopes thousands of feet high – even on these some vegetation is clinging on for dear life. Our picnic site is out of this world – the ravine opens out into a small flat valley surrounded by mountains so stunning I feel slightly hysterical. The softer rocks have been eroded away leaving all manner of odd looking crags and pinnacles – like something straight from Lord of the Rings. My grasp on reality is not helped by the picnic Tashi produces from the hamper in the back of the car, along with stools and blankets for us to sit on. We have delicious tomato soup, sandwiches, salads, juice and coffee and more cakes than we can possibly manage. As we eat, we watch a Lammergeier circling the peak in front of us. After lunch Helen and I climb a little way up the closest hill in search of plants. 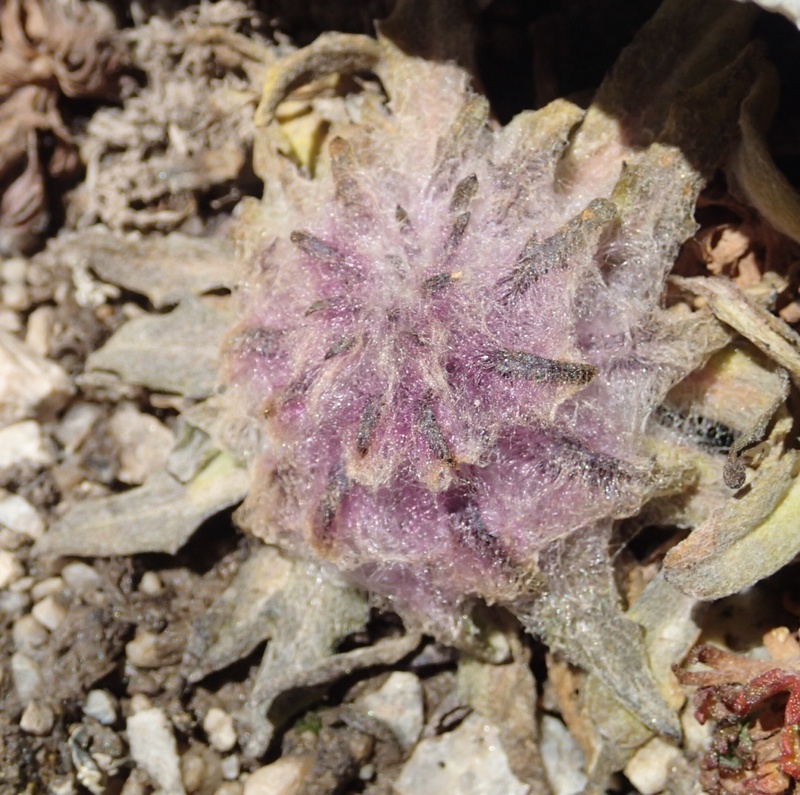 Even In this inhospitable terrain we find a purple flowered labiate which may be catmint, Tanacetum, and a good variety of lichens. Where a little more soil has had a chance to collect, buckthorn is abundant and a pretty yellow-flowered clematis, mostly gone to seed now. 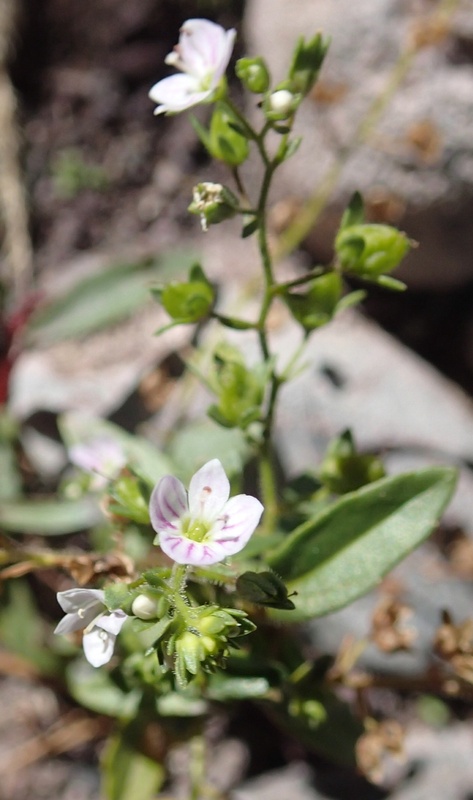 Artemisia dubia is abundant around the stream and, in the water, the tiny, pink-flowered water speedwell, Veronica anagallis-aquatica. 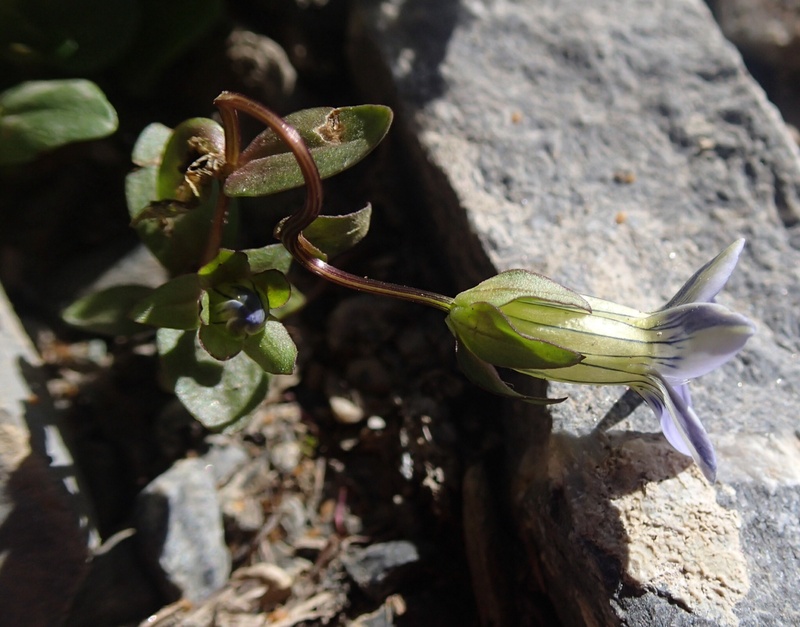 We discover that one of the less obvious effects of altitude sickness, especially after eating, is that crouching down to look at flowers is distinctly uncomfortable – anything that gives our lungs less room to expand seems to be a problem. As we drive down the gorge after our latish lunch the rocks are already in shadow – different features are highlighted now. 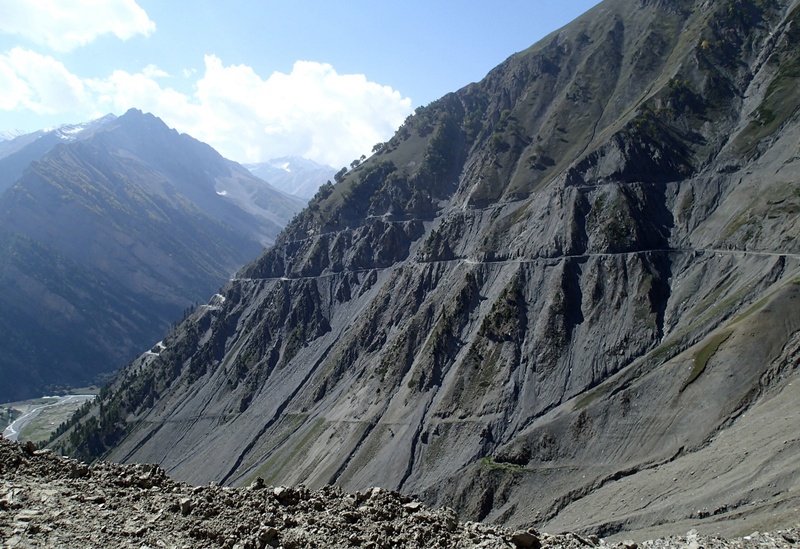 We drive the few km along the Manali road to Igu where CP has told John he should be able to see the contact between the granite batholiths and Indus Molasses on either side of the suture zone. 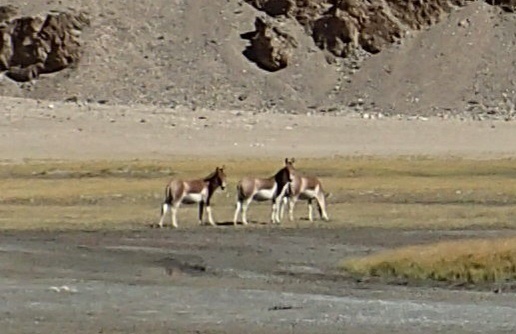 This proves elusive, so we decide to have another look on our way to Pangong Tso when we are all less tired.